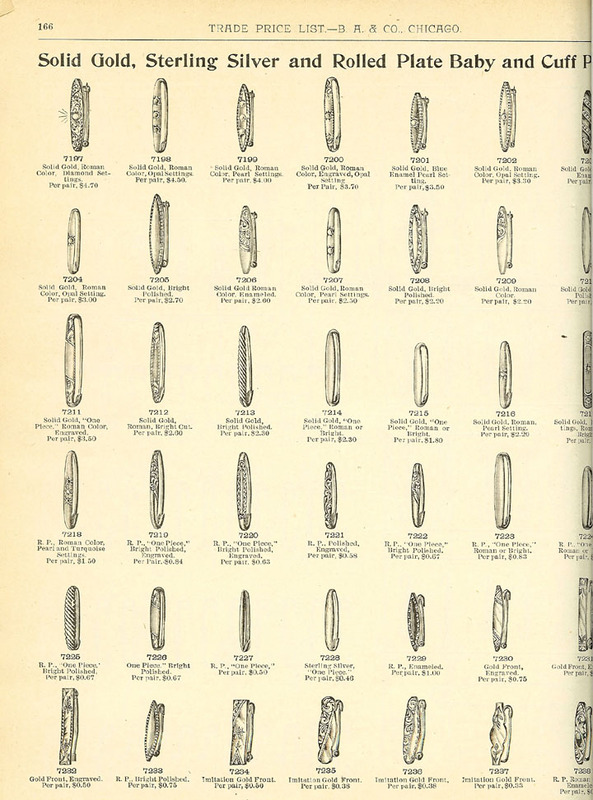 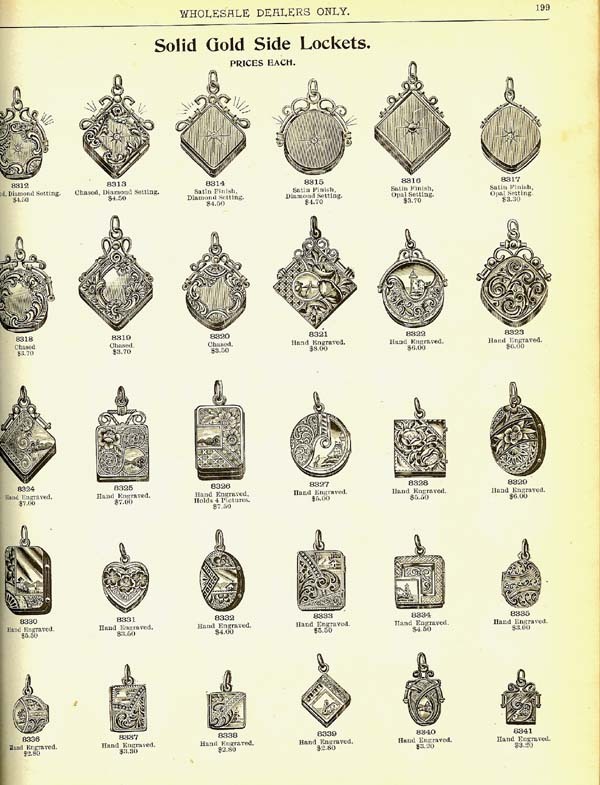 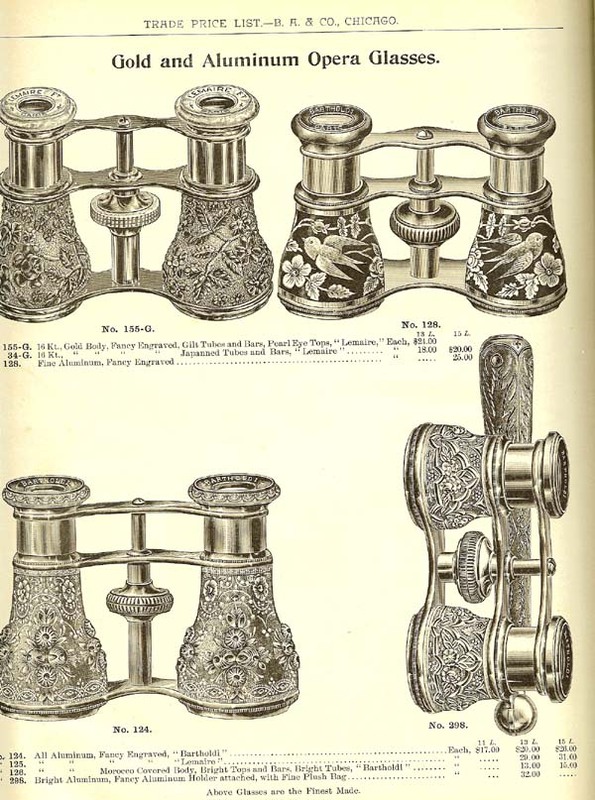 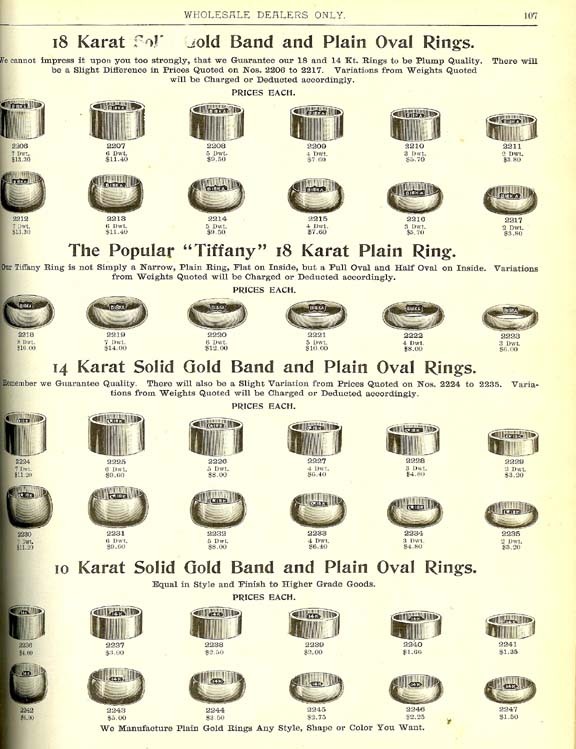 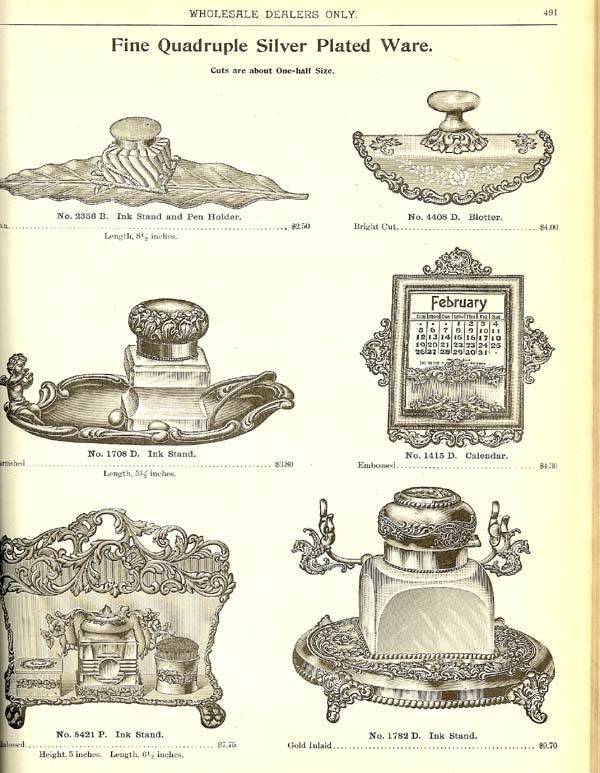 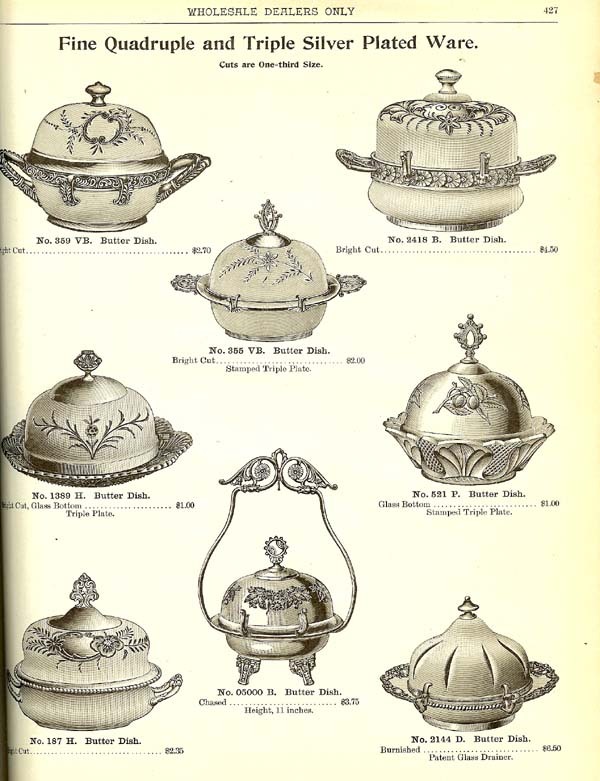 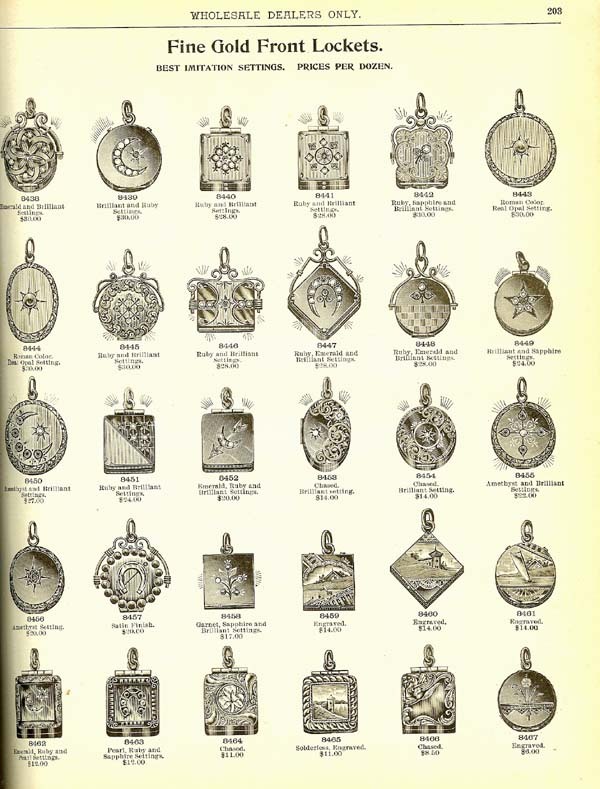 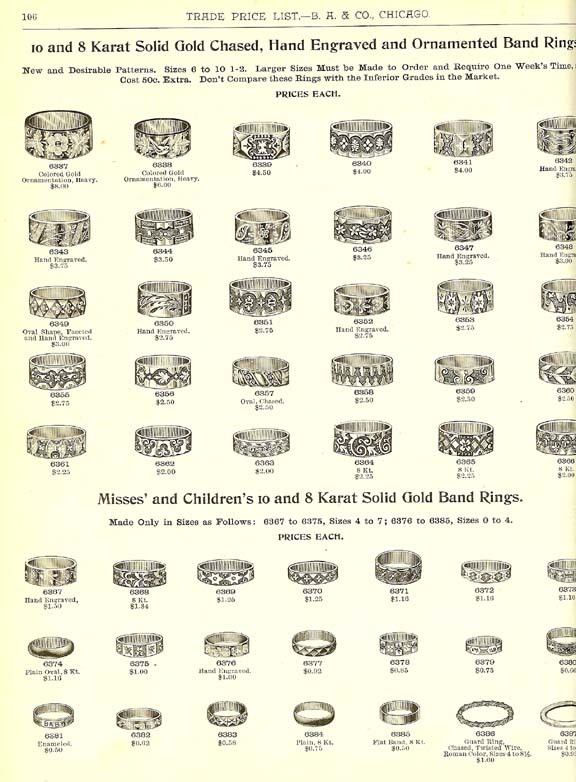 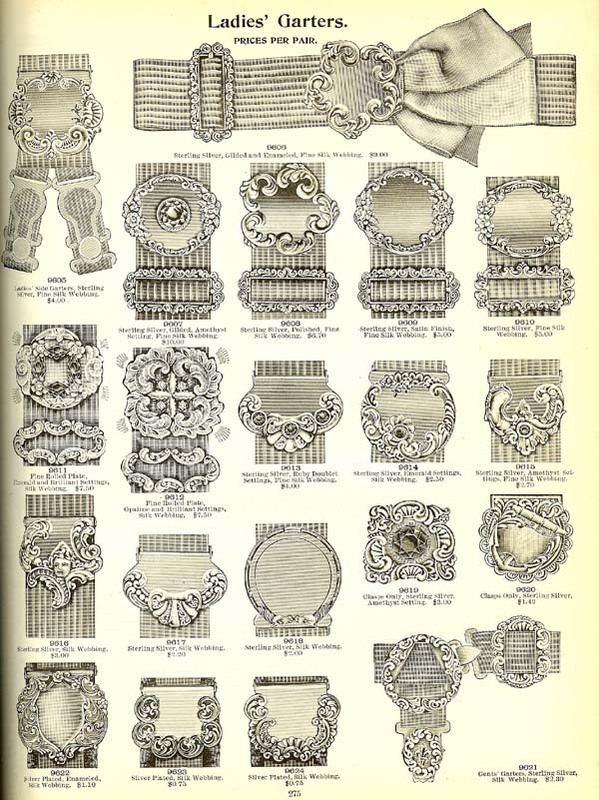 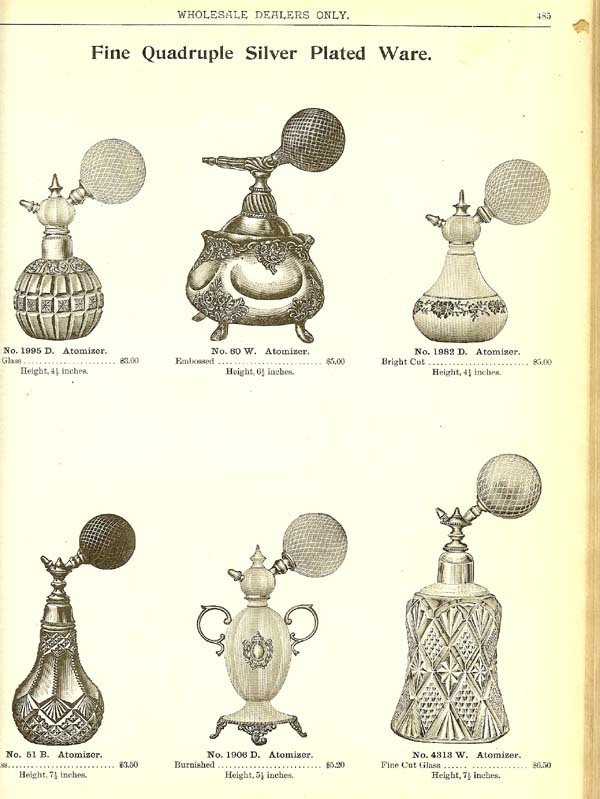 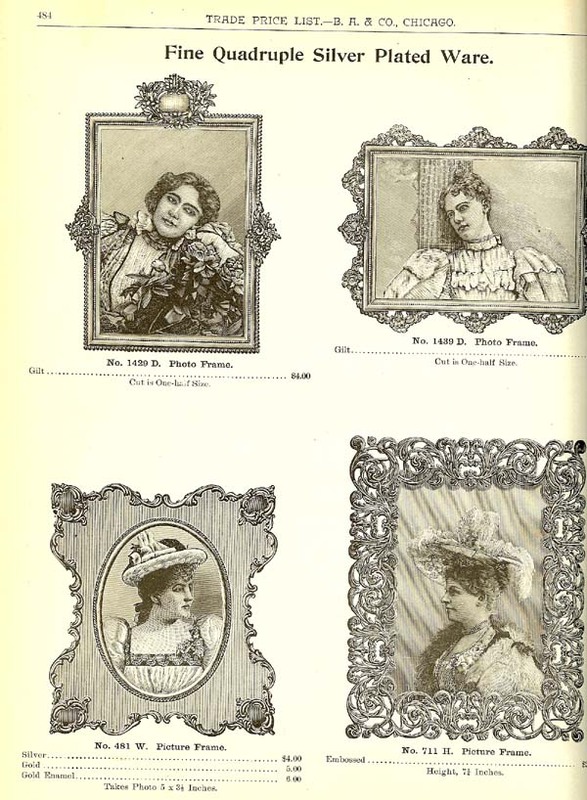 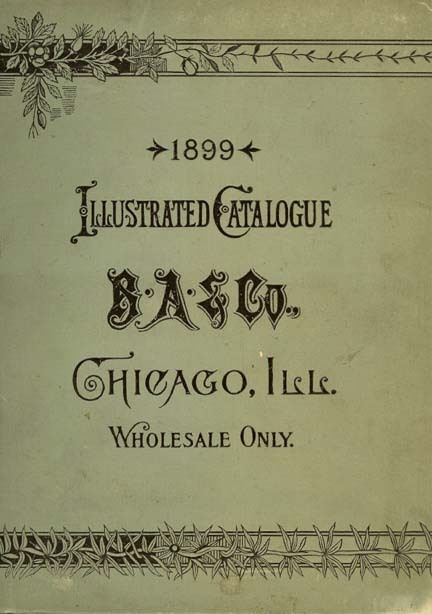 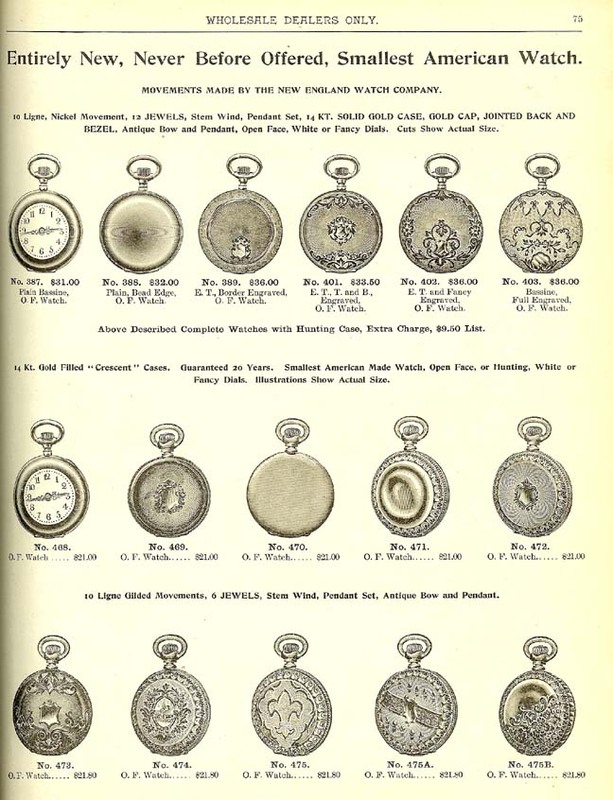 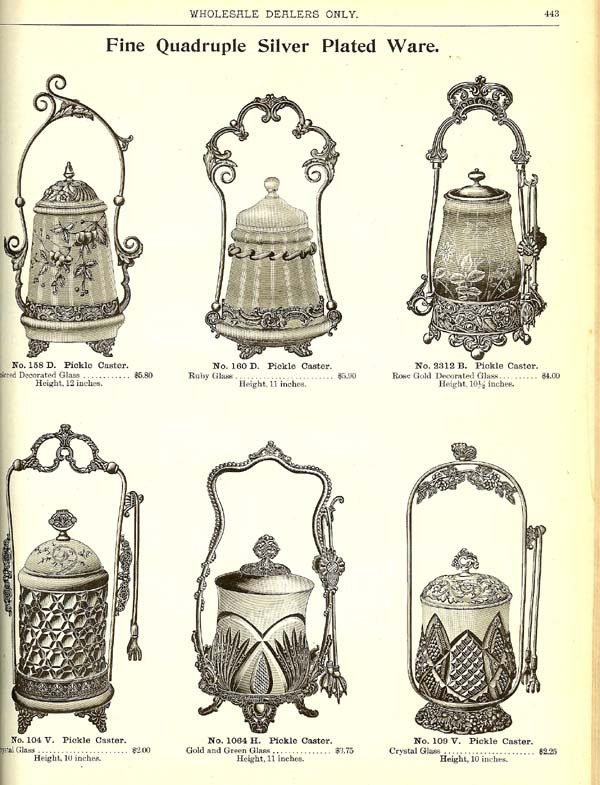 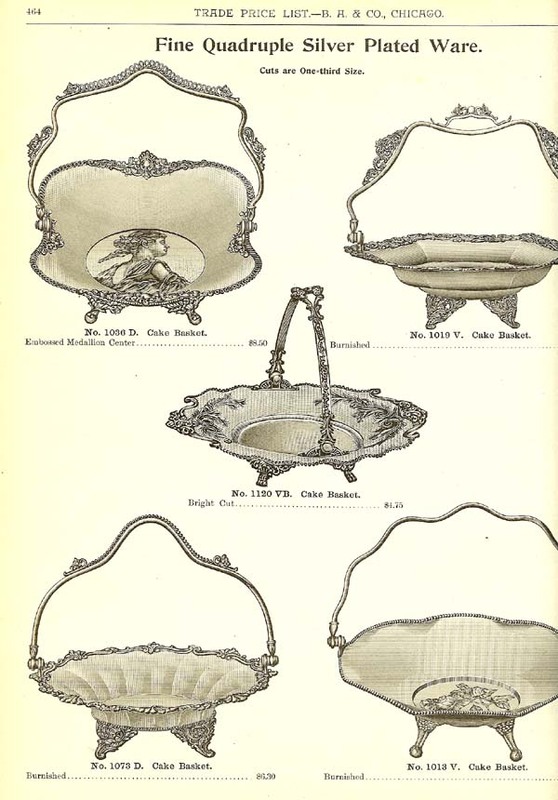 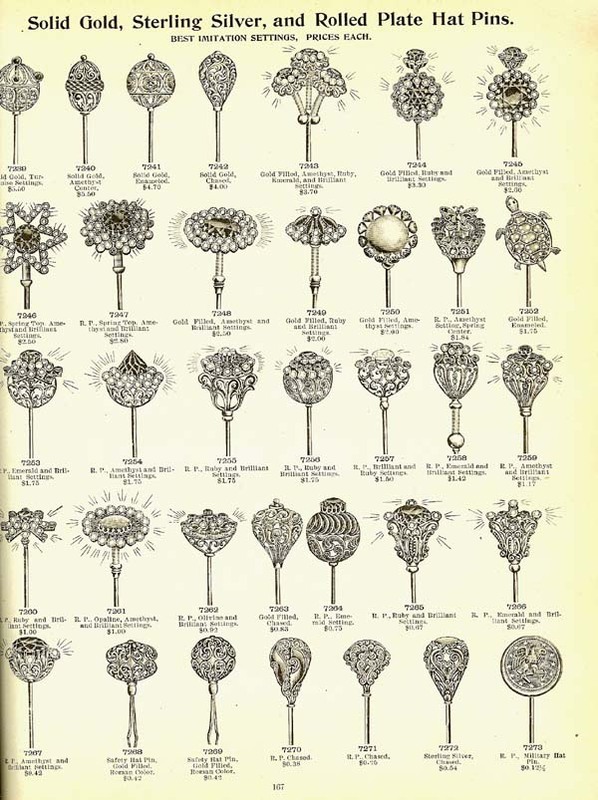 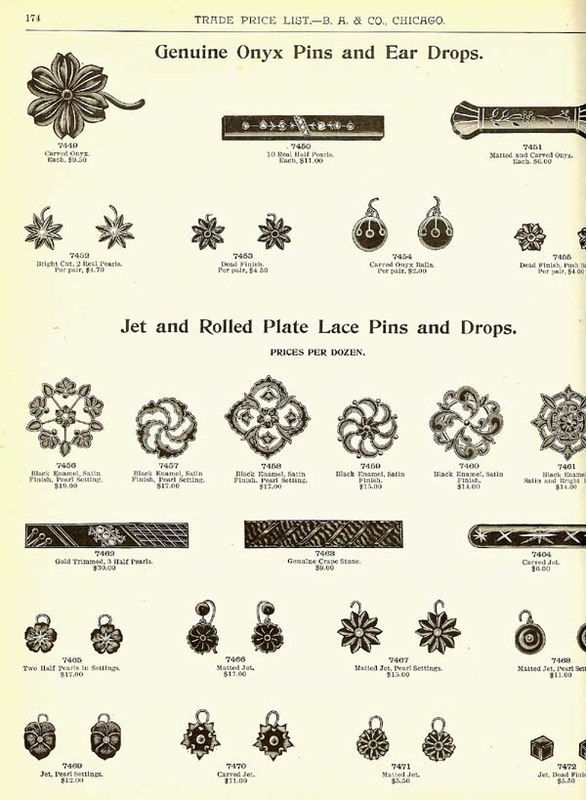 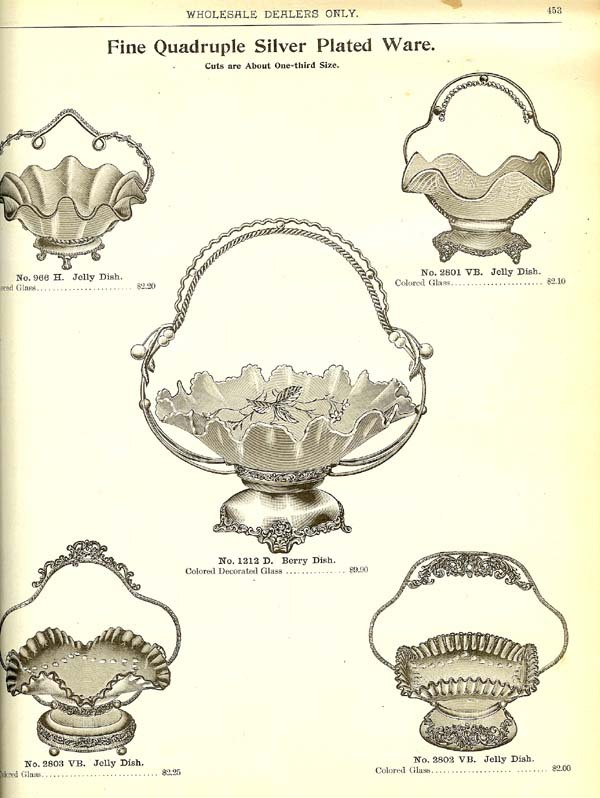 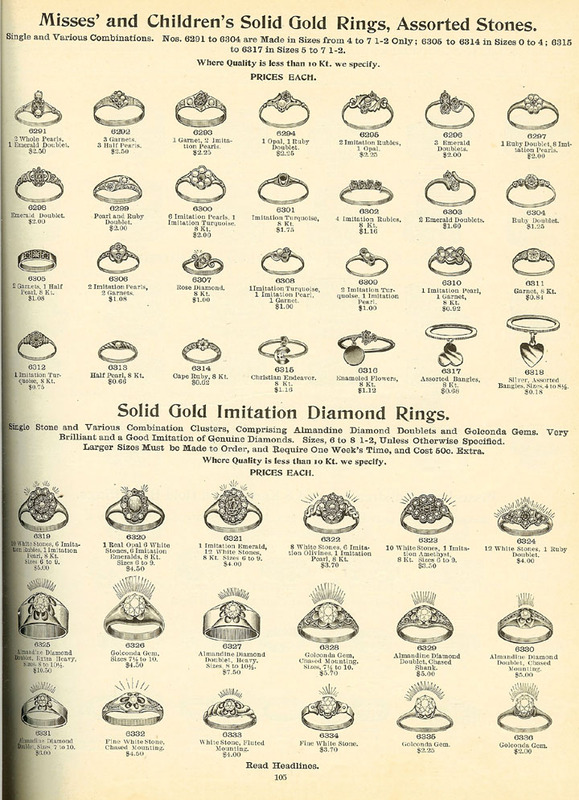 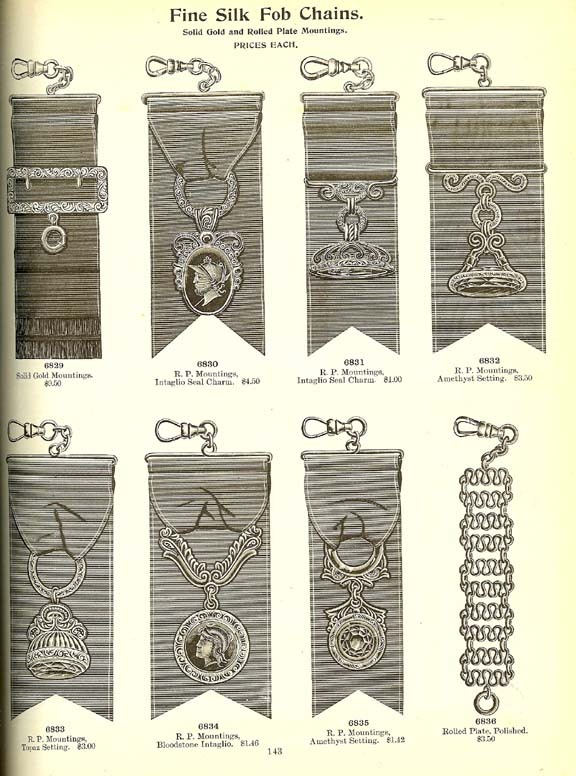 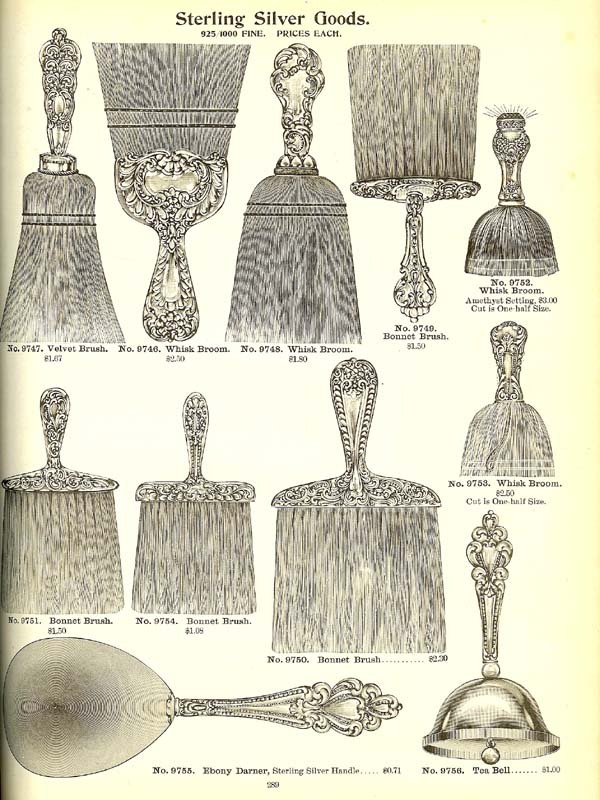 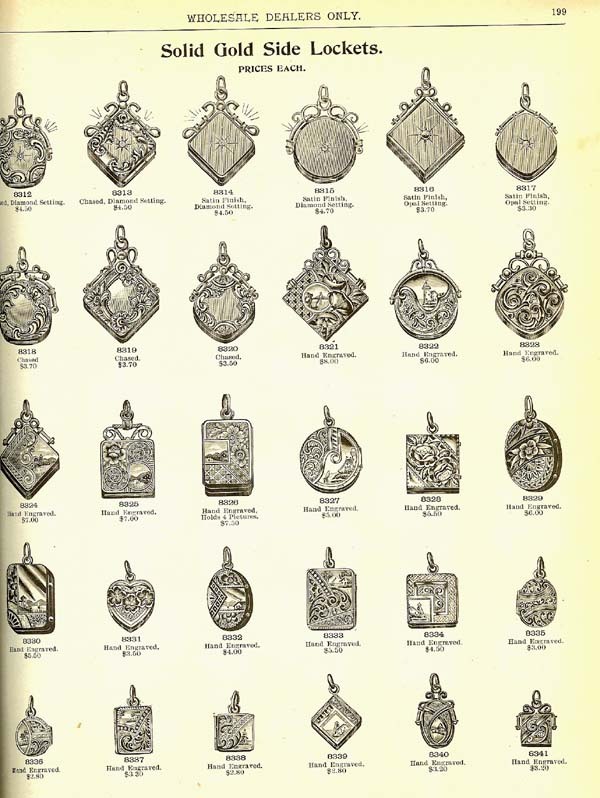 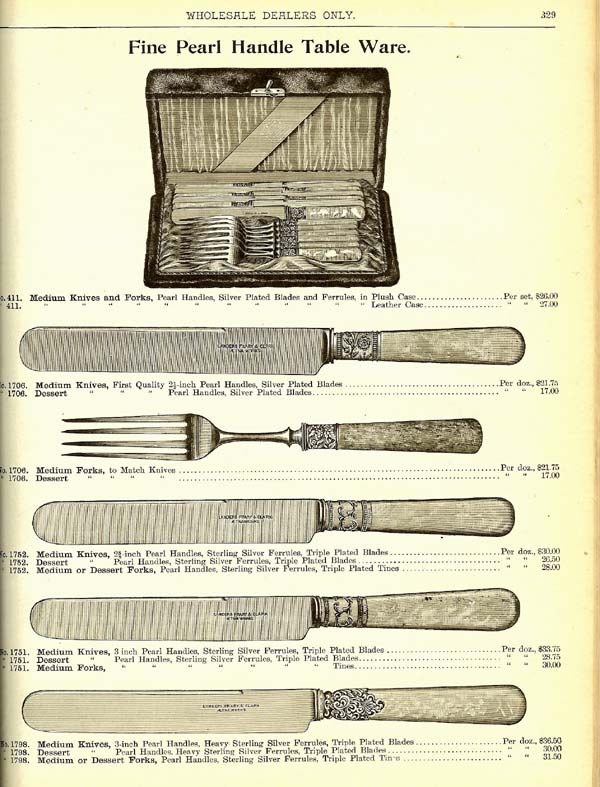 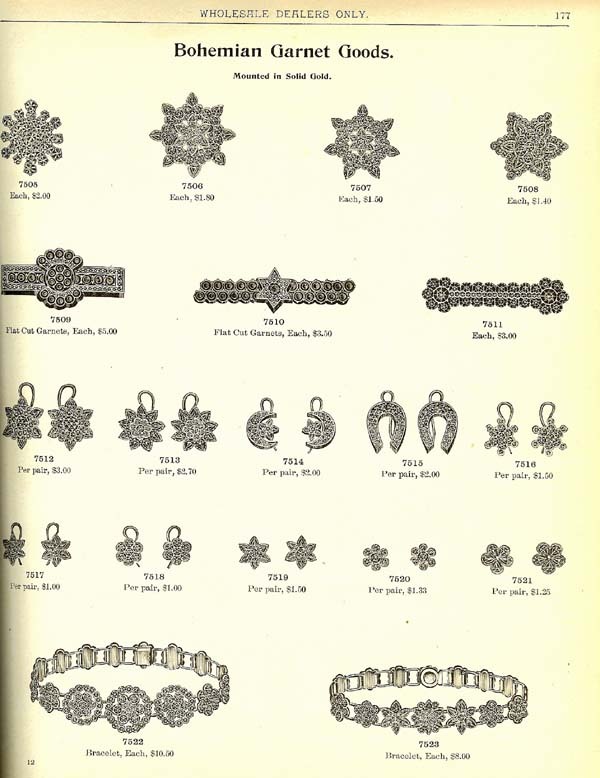 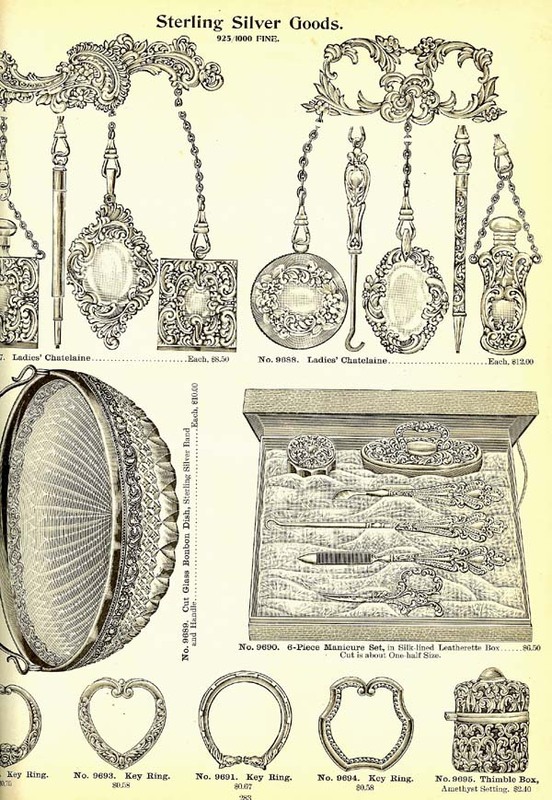 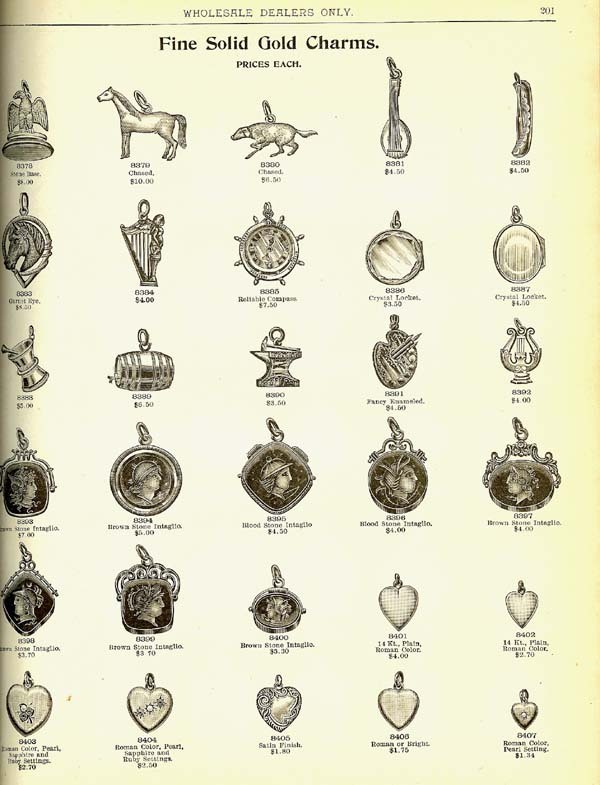 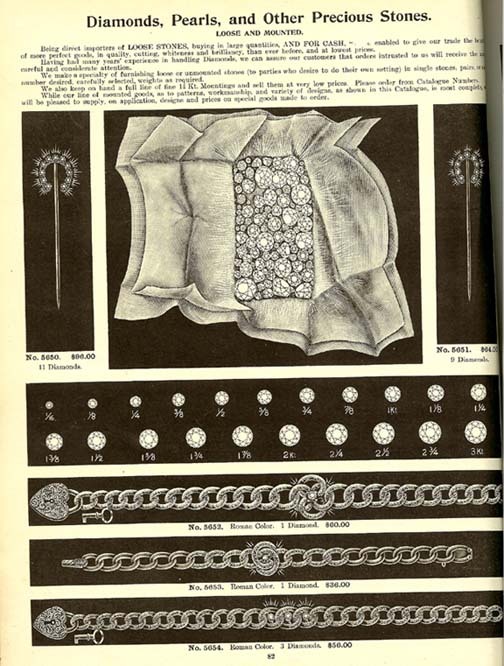 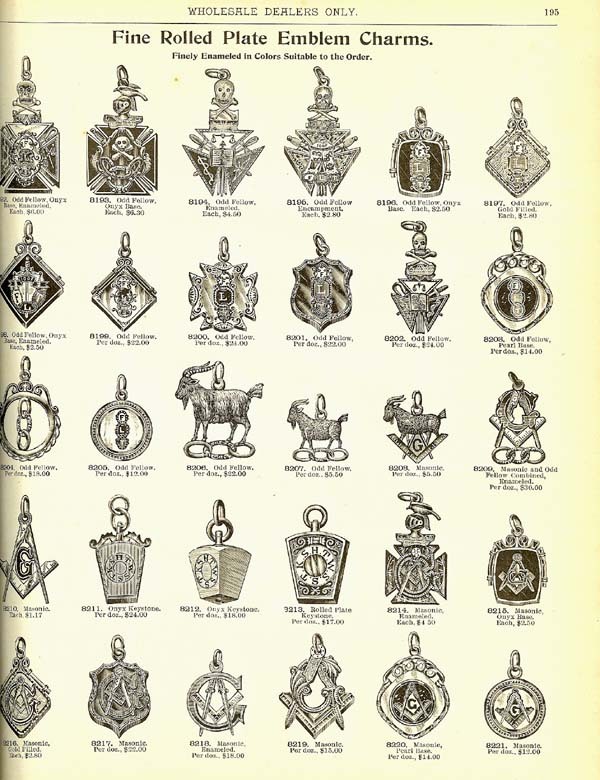 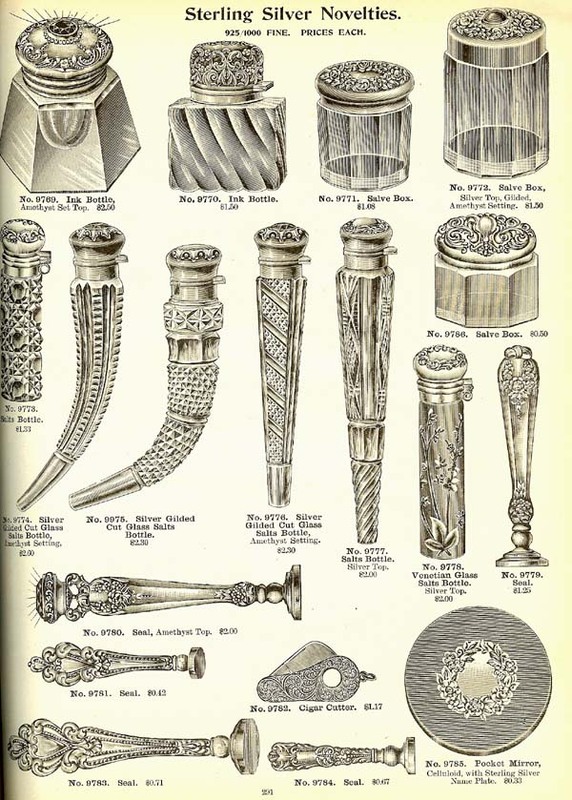 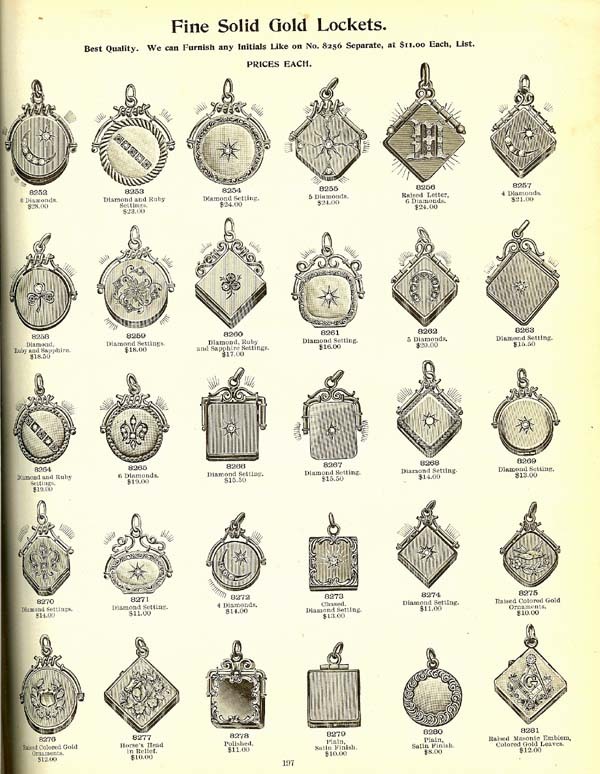 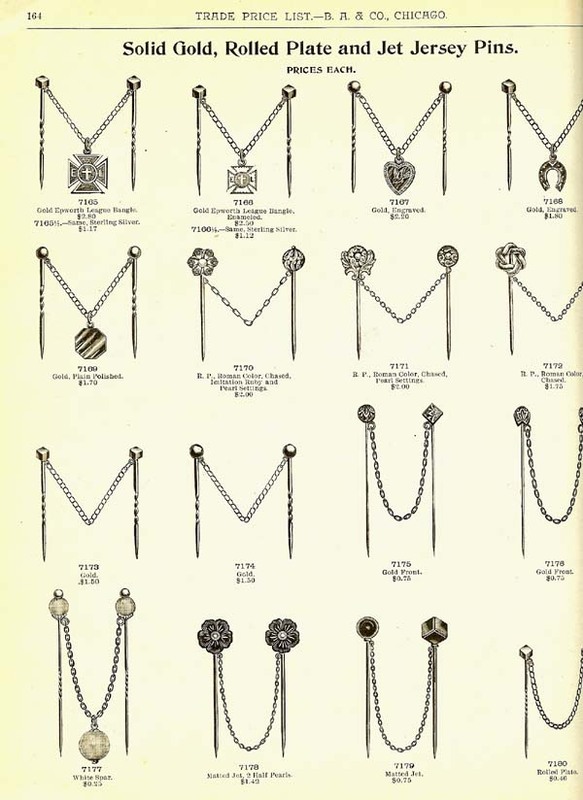 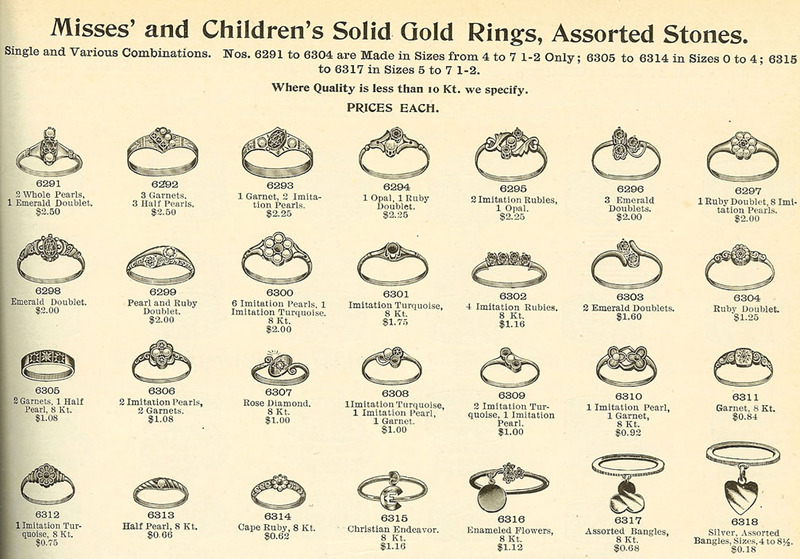 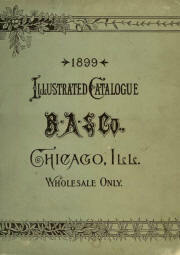 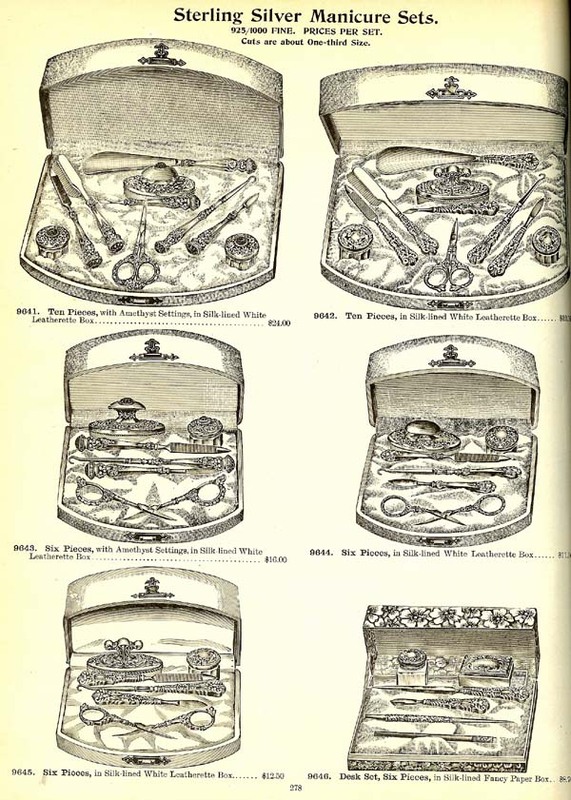 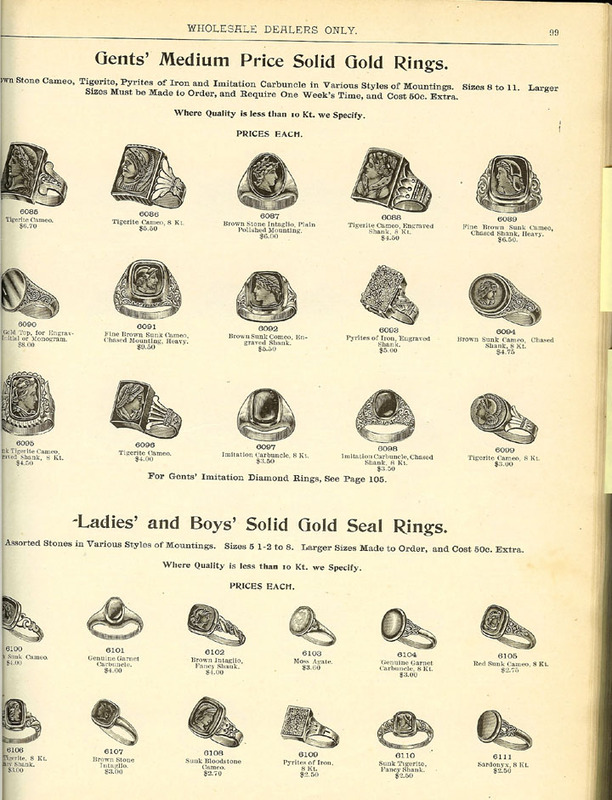 This original Benjamin Allen & Co. catalogue from 1899 includes in it's over 350 pages everything from diamonds, watches, costume jewelry, clocks, sterling silver, silver plated ware and optical goods, as well as equipment for jewelry stores and watch makers. 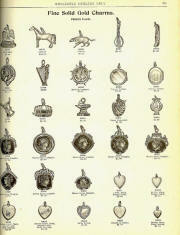 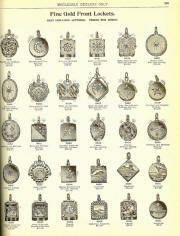 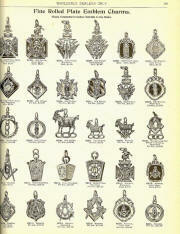 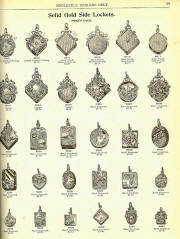 STERLING silver lorgnettes. 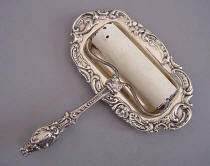 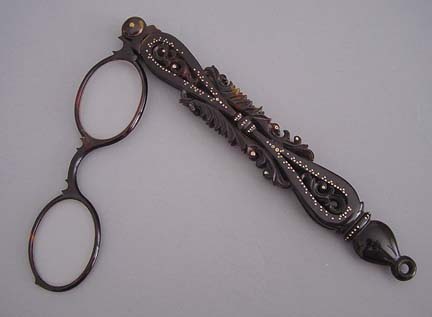 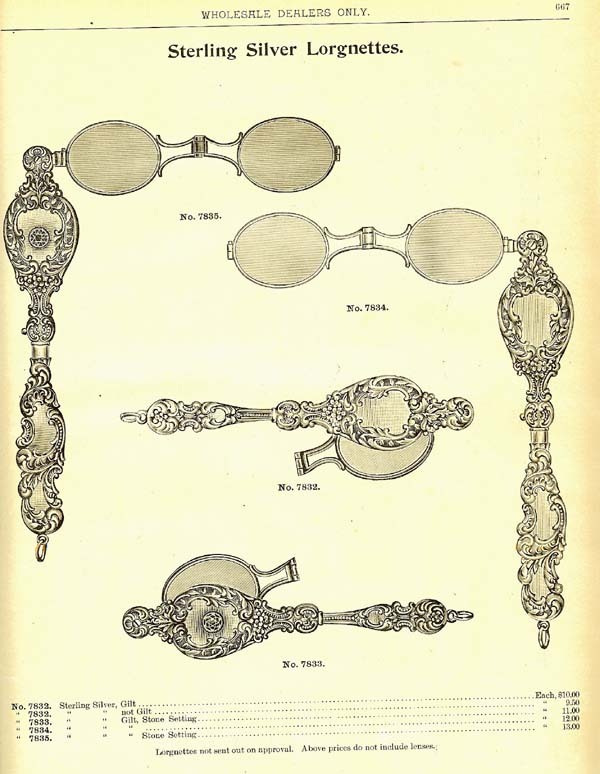 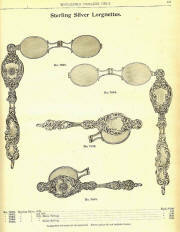 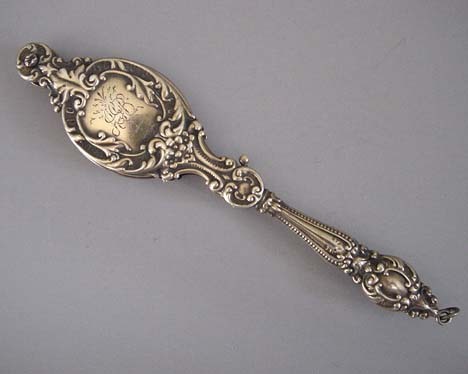 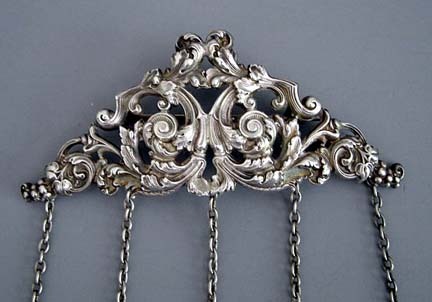 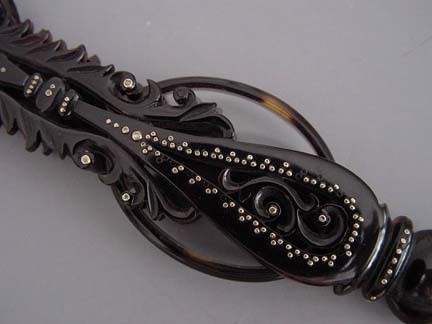 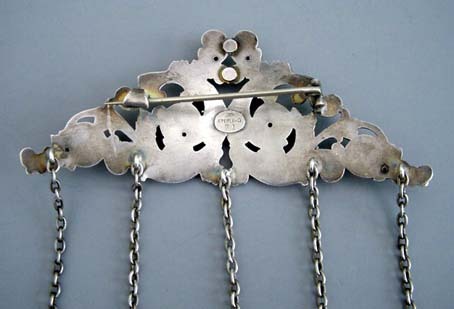 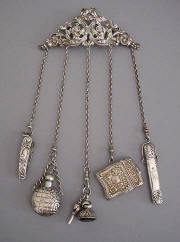 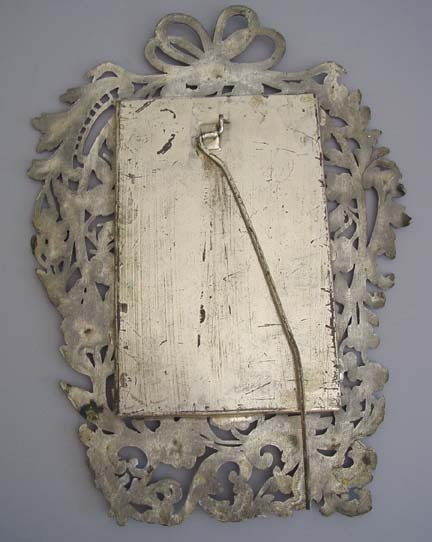 VICTORIAN sterling lorgnette with spring flowers motif, engraved initials "DWC", 5". 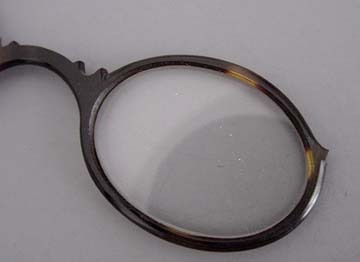 View #Q28705 IMITATION tortoise shell lorgnettes. 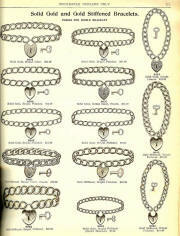 DIAMONDS, pearls and other precious stones, heart lock bracelets. 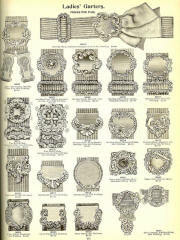 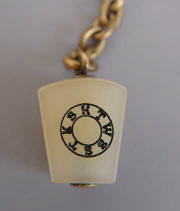 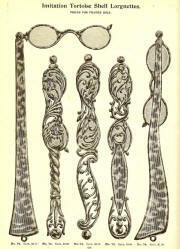 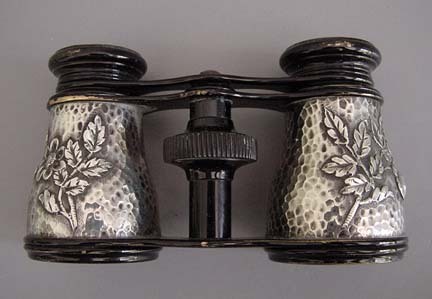 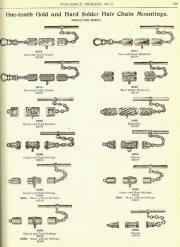 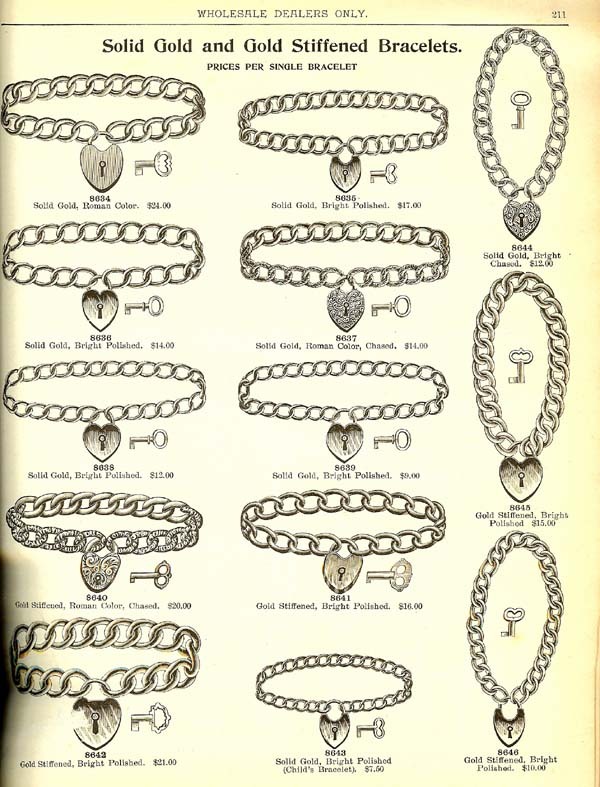 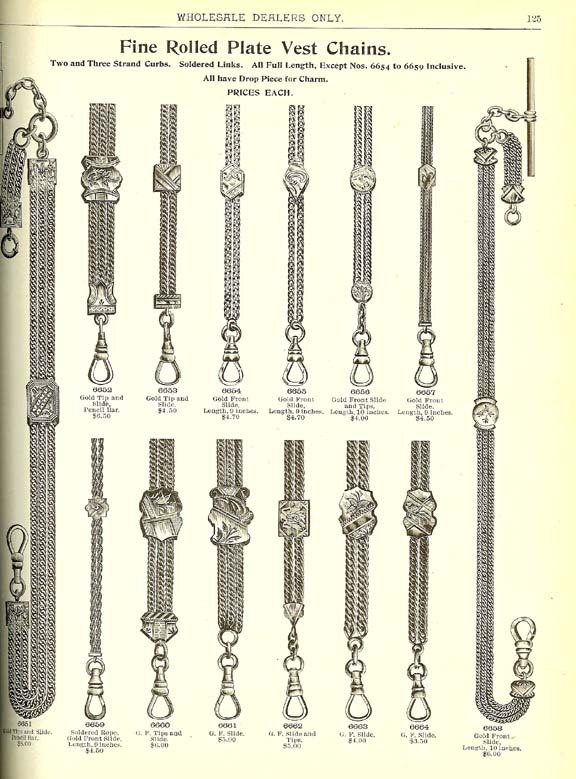 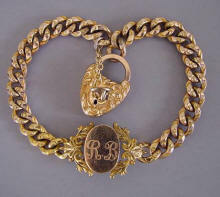 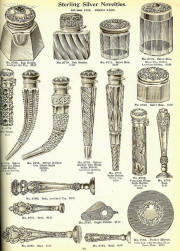 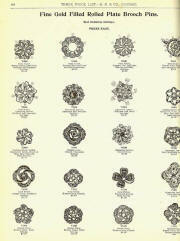 B. Allen Catalogue, 1899 VICTORIAN embossed links 7" bracelet with oval center engraved "RB" and 7/8" lock and key. There is an illegible maker's mark on one link. 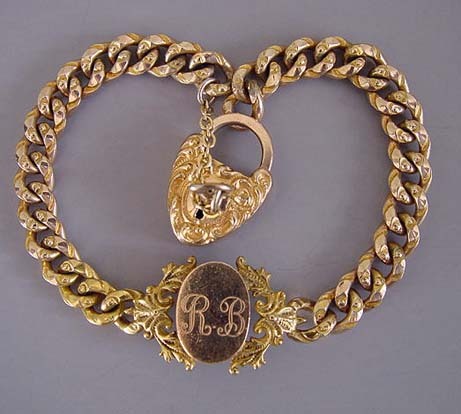 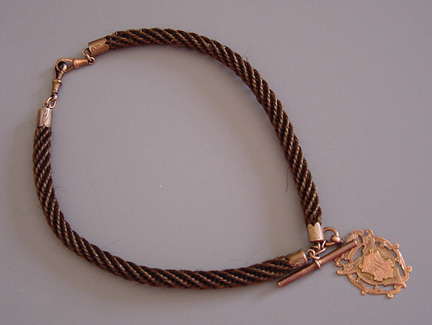 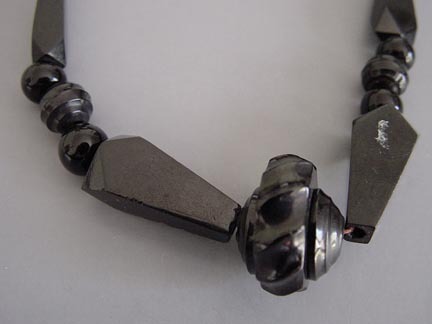 Bracelets like this can be seen in Romero's Warman's Jewelry Ed. 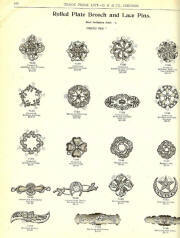 3 on page 70. 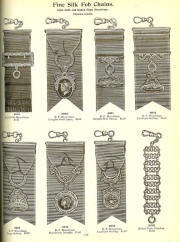 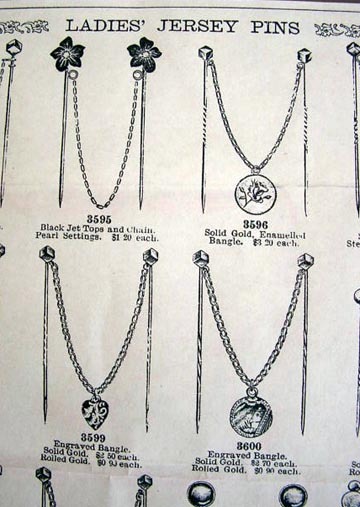 #V28021 DIAMOND lockets, fobs and sleeve buttons. 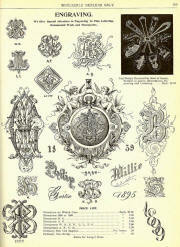 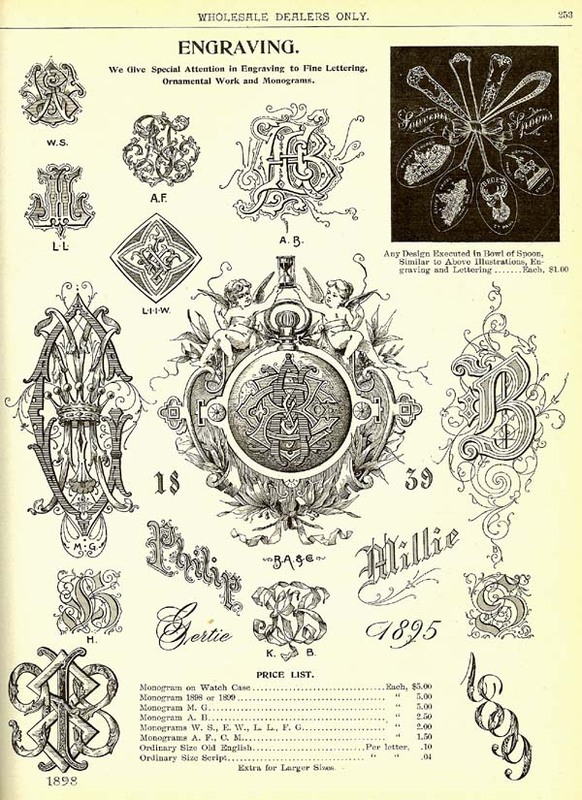 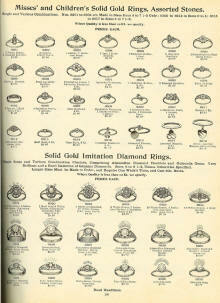 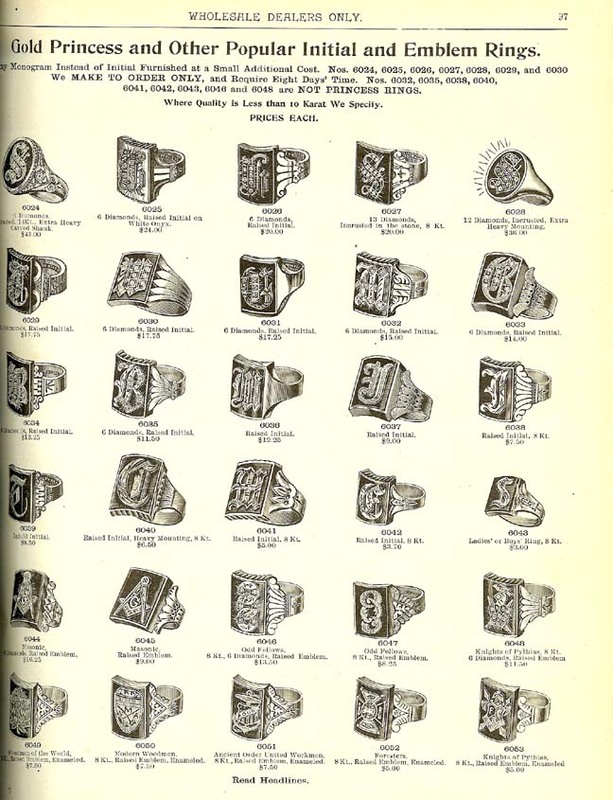 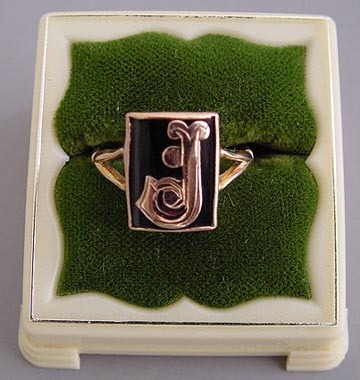 GOLD Princess and other popular initial and emblem rings. 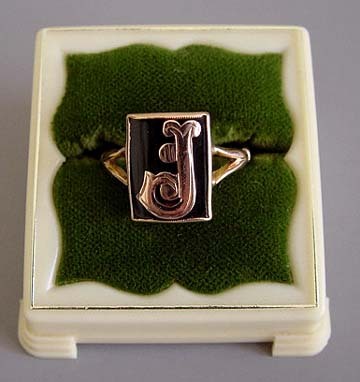 RING 9k and black enameled ring initial "J", circa 1890, size 6-3/4. 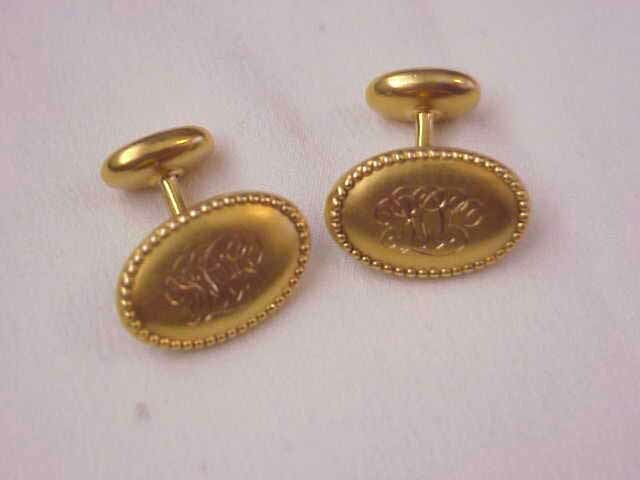 #G21551 SOLID gold, rolled glad plate and jet jersey pins. 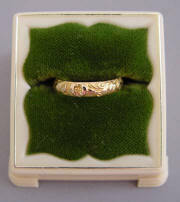 18k SOLID gold band and plain oval rings. 18k GOLD heavy wedding band. 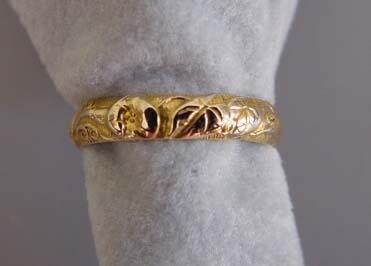 #Gwdb 10k and 8k SOLID gold chased, hand engraved and ornamented band rings. 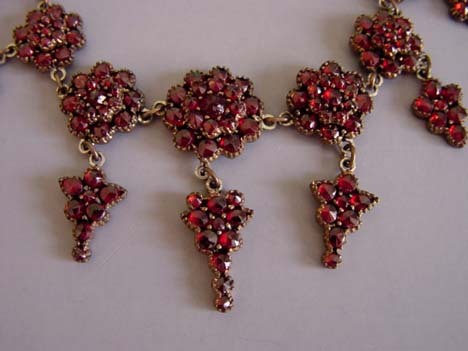 BOHEMIAN garnet necklaces, bracelets, cross and hair pins. 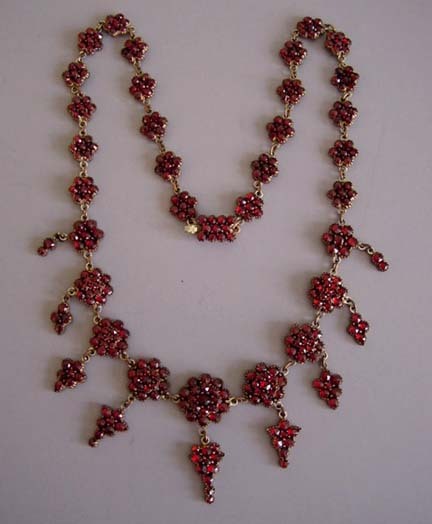 BOHEMIAN garnets set in sterling gilt necklace with graduated floret links and front drops, garnet set box closure, 18-1/2" by 1-1/3". 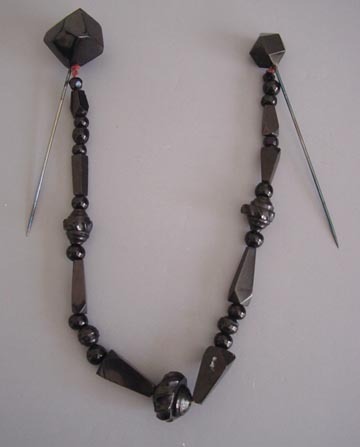 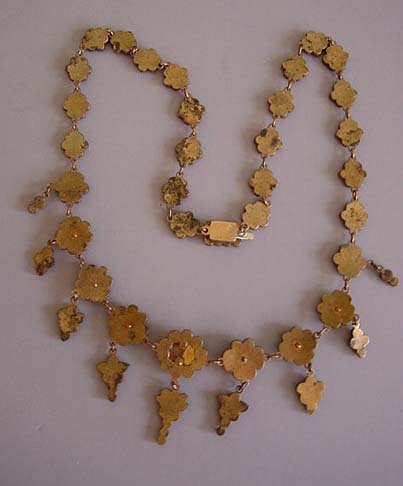 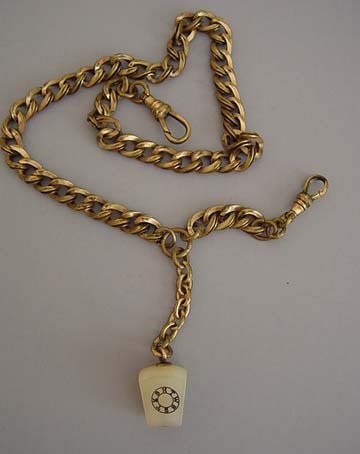 See a similar necklace in Romero's Warman's Jewelry Ed. 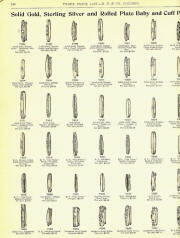 3 on page 88. 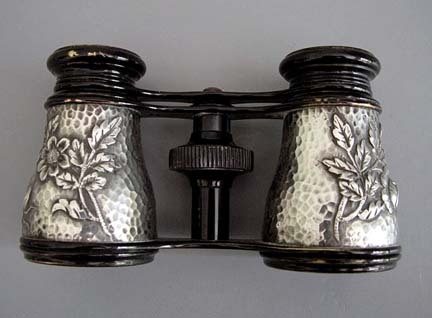 View View View #V29371 BOHEMIAN garnet goods. 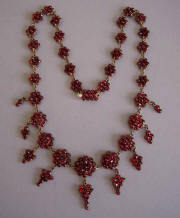 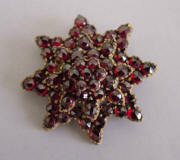 BOHEMIAN garnet goods mounted in solid gold. 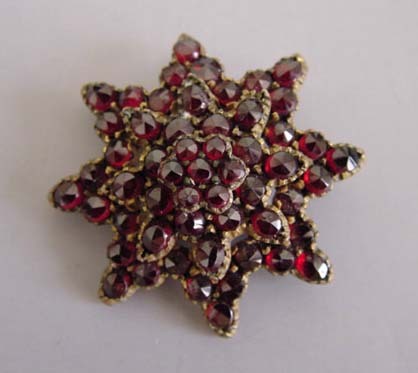 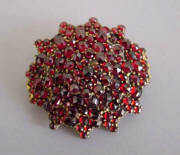 BOHEMIAN rose cut garnet brooch with pendant loop on back, circa 1900, 1-1/3". 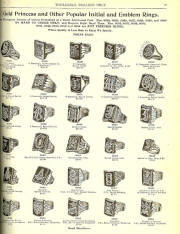 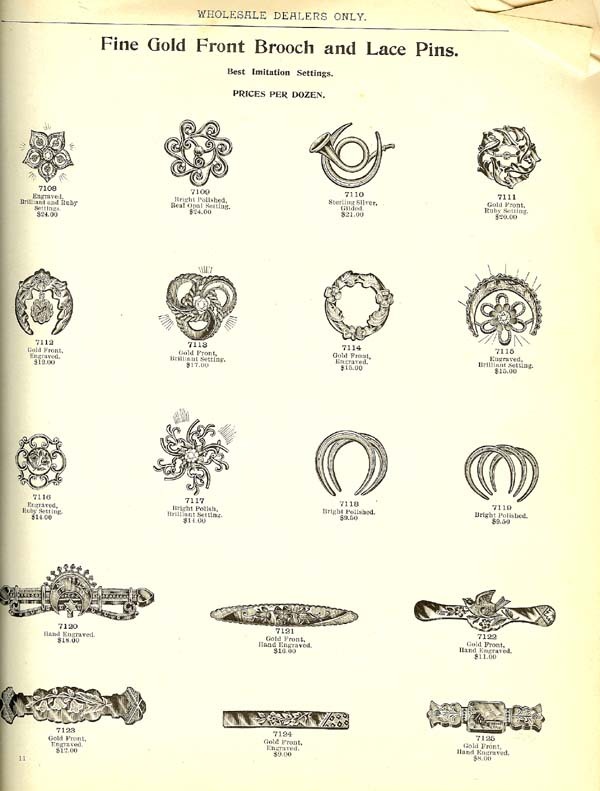 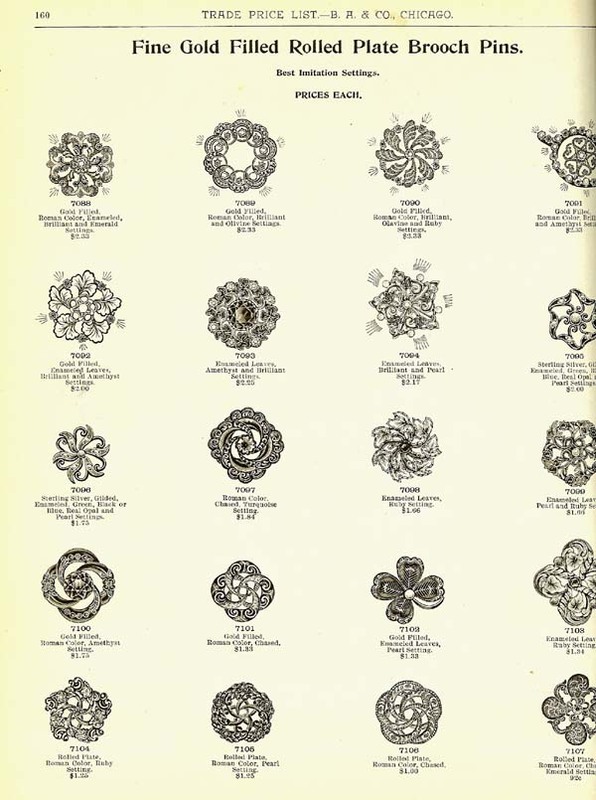 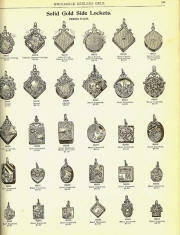 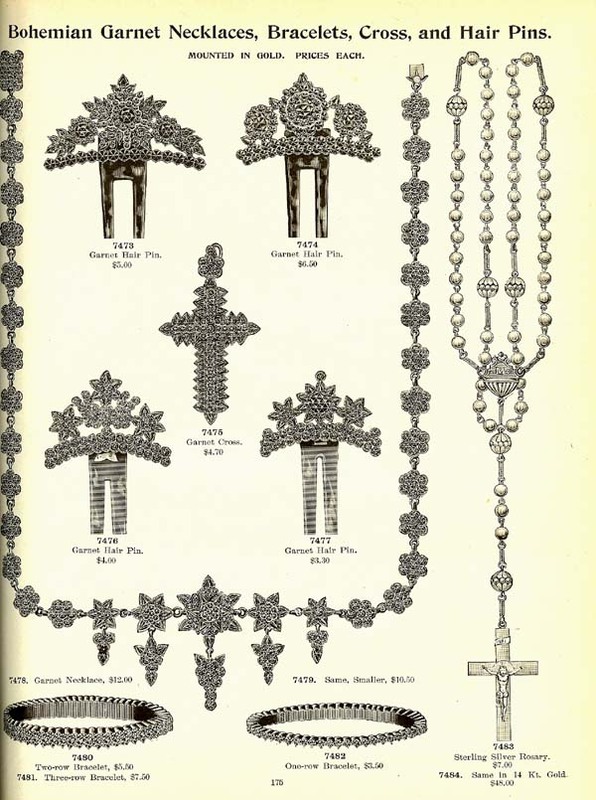 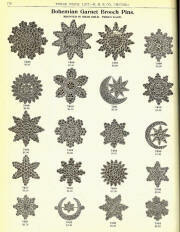 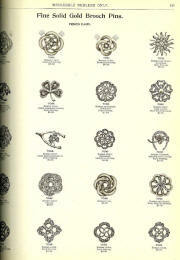 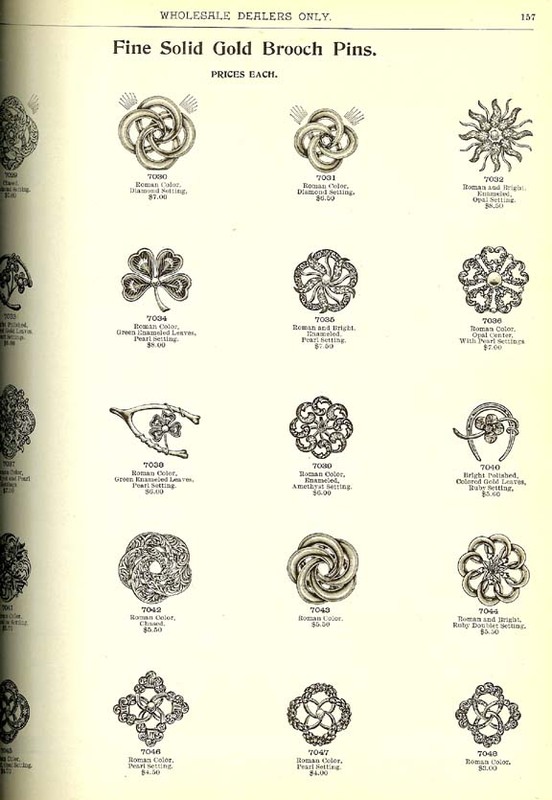 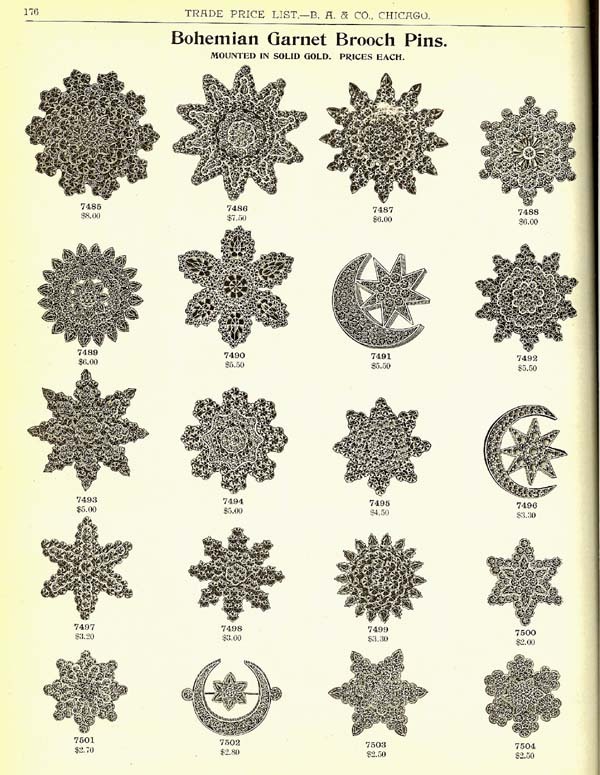 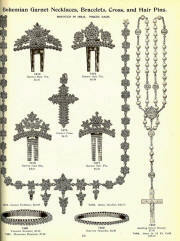 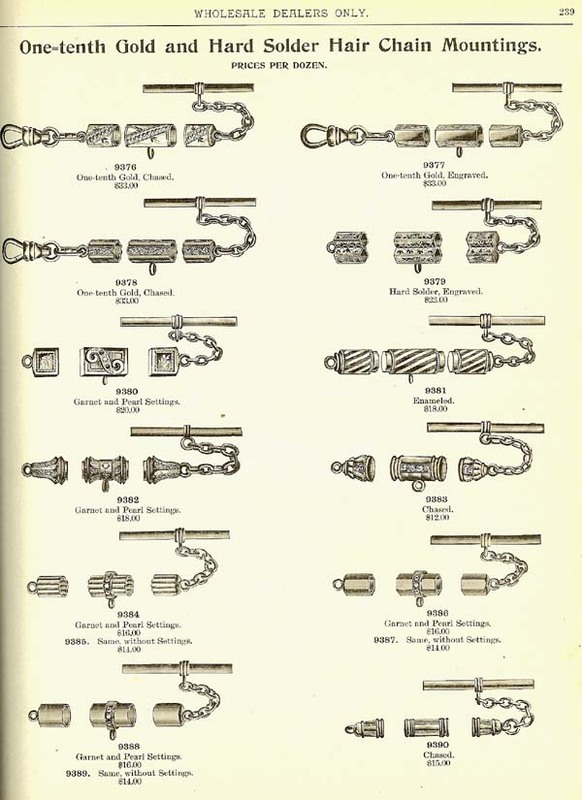 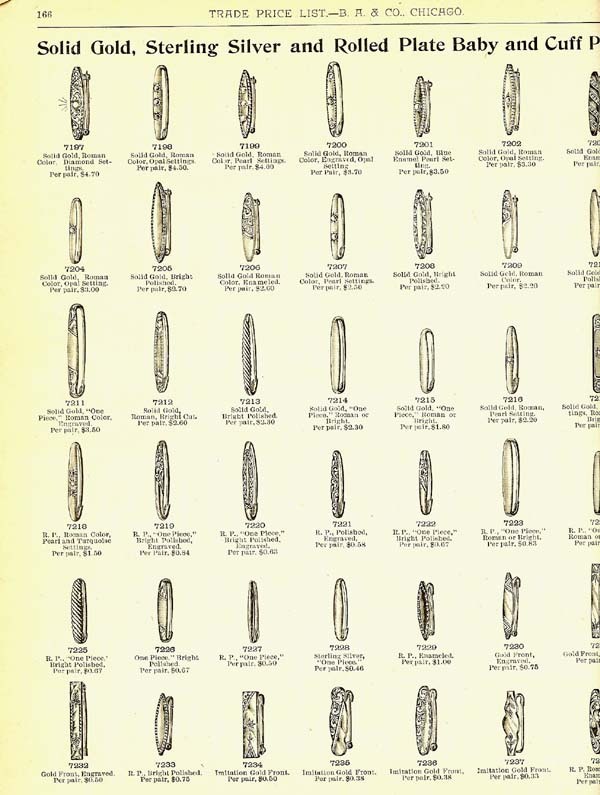 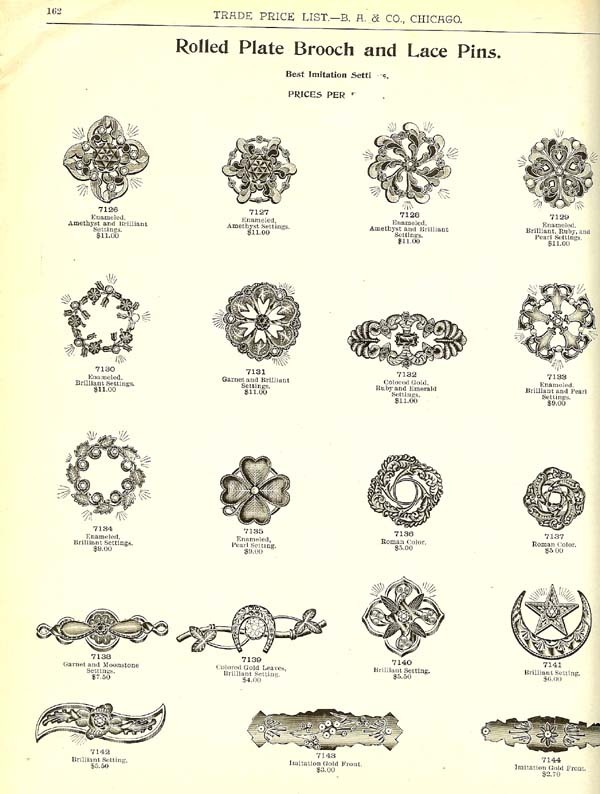 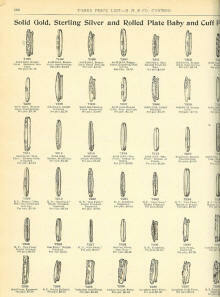 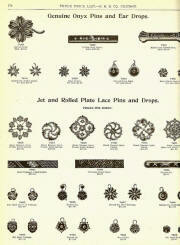 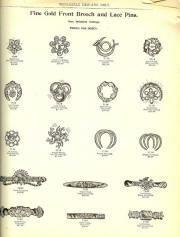 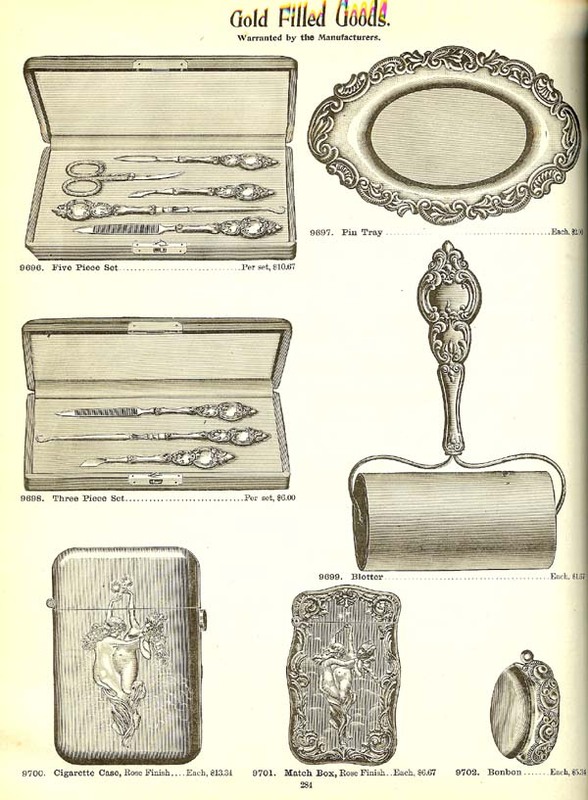 See Romero's "Warman's Jewelry, Ed. 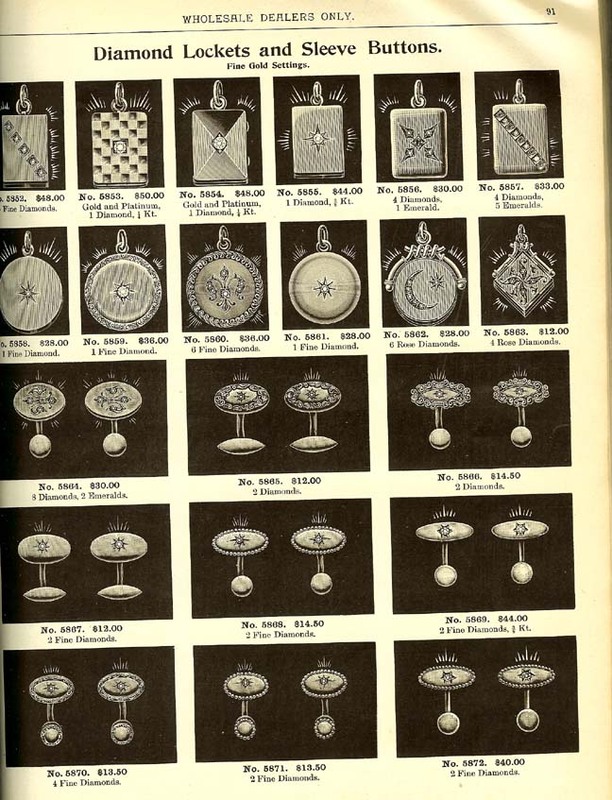 2" page 69. 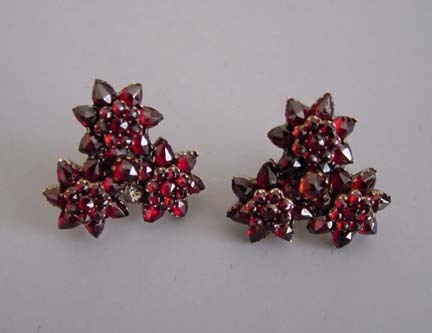 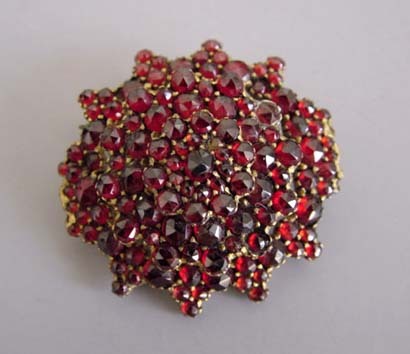 View #Q27930 BOHEMIAN garnet goods mounted in solid gold. 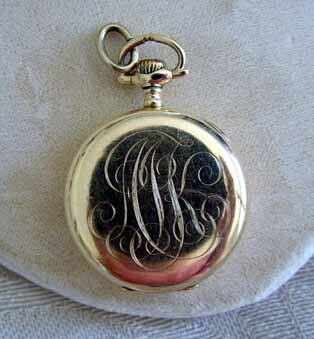 Benjamin Allen Catalogue, 1899 ELGIN lady's open face 14 karat gold pocket watch engraved with the initials "AJK", my grandmother's. 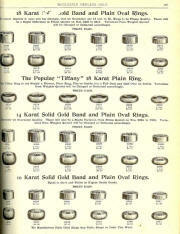 View #w20423 ONE-TENTH gold and hard solder hair chain mountings. 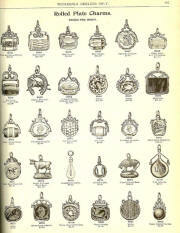 STERLING silver goods, chatelaines, key rings, thimble box. 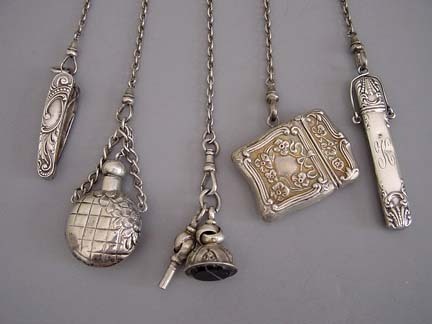 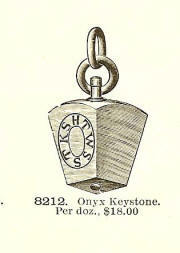 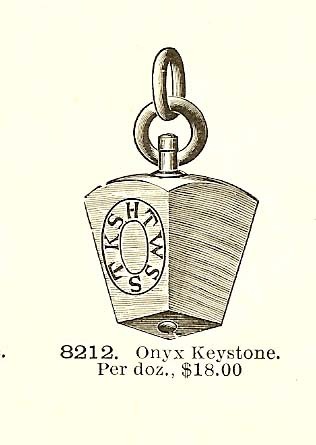 KERR sterling 4" by 5"chatelaine with 1-1/2" knife, 1-1/2" perfume, fob and key, 1-1/3" match and 3-1/8" pencil. 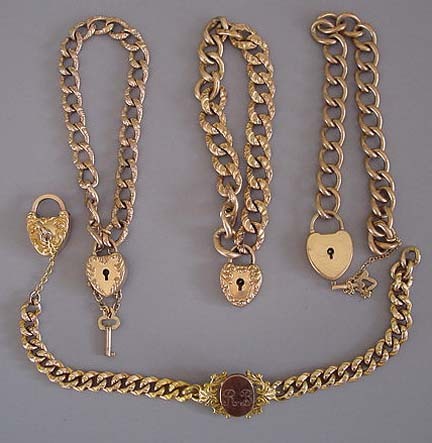 View View View View #V24854 SOLID gold and gold stiffened bracelets. 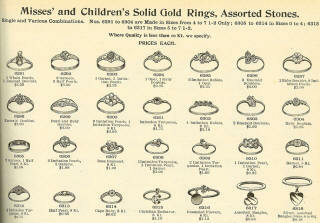 Misses' and children's solid gold rings, garnet, turquoise, ruby, emerald, opal, pearl and enameled. 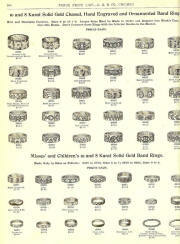 Solid gold rings, assorted stones. 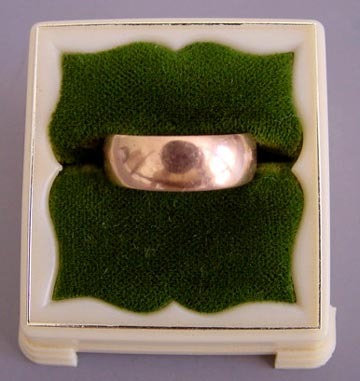 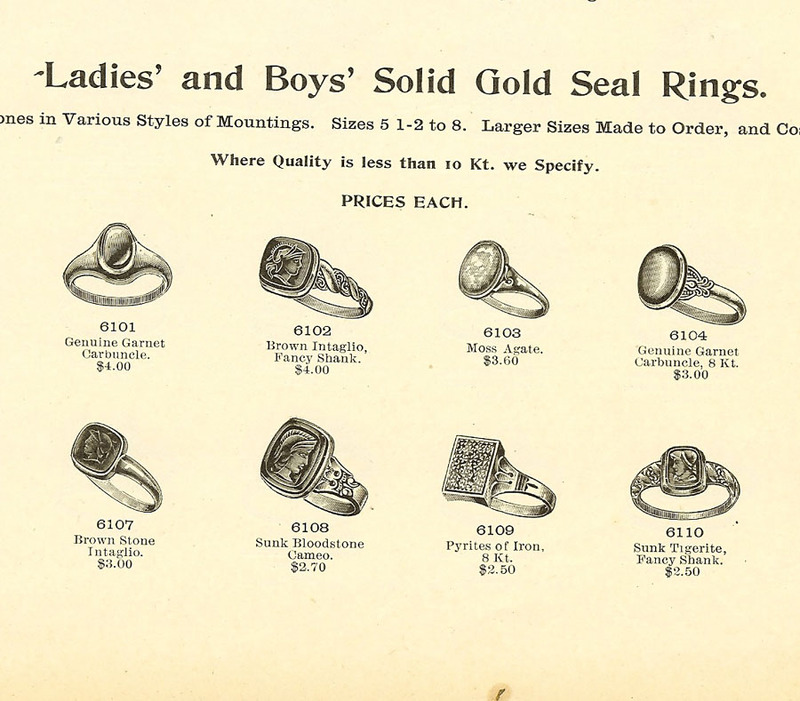 Ladies' and boy's solid gold seal rings, carbuncle, cameo, intaglio. 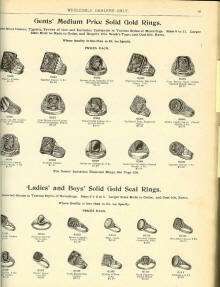 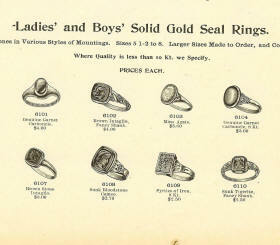 Ladies' and boy's solid gold seal rings. 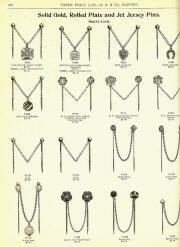 Solid and imitation gold, sterling silver and rolled plate baby and cuff pins. 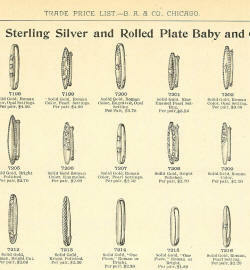 Sterling silver and rolled plate baby pins. 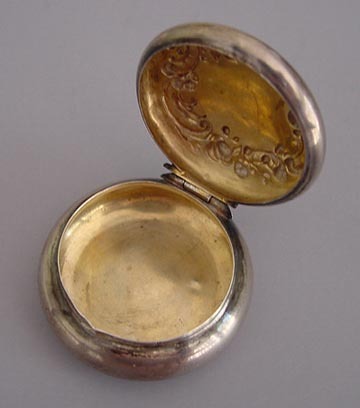 SILVEROID 0 and 6 size and coin silver 0 and 6 size watch cases. 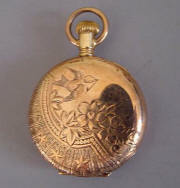 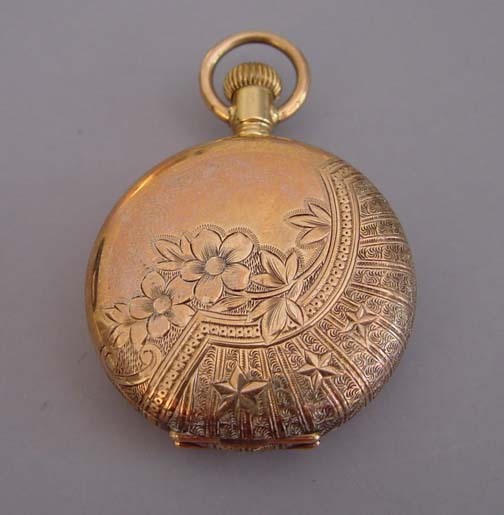 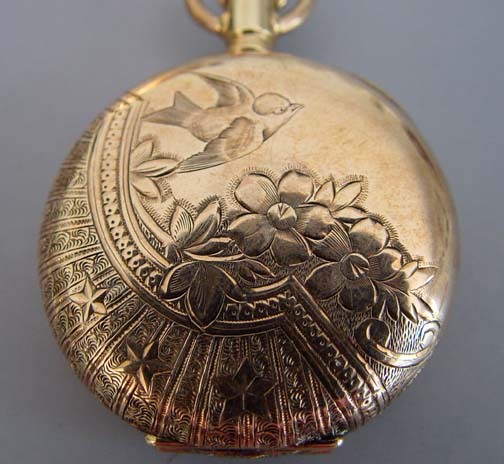 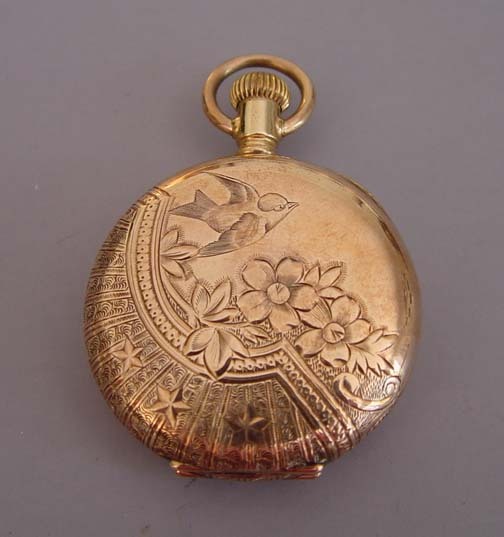 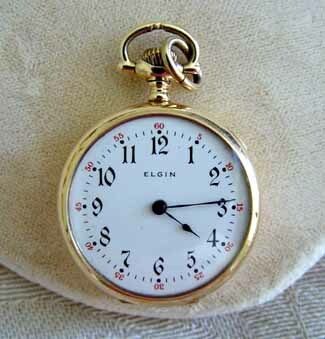 ELGIN yellow gold 1-1/3" pocket watch with engraved bird and flowers design, circa 1900. 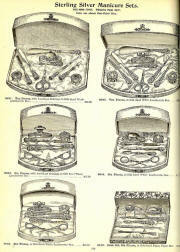 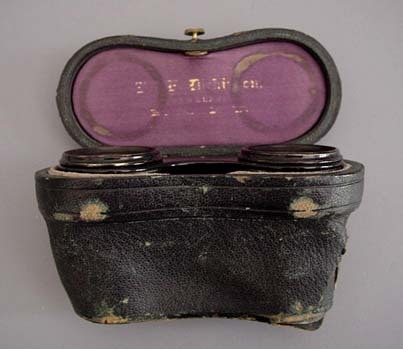 View View #w50715 16 and 18 SIZE nickel and silveroid watch cases. 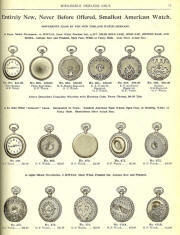 ENTIRELY new, never before offered, smallest American watches made by the New England Watch Company. 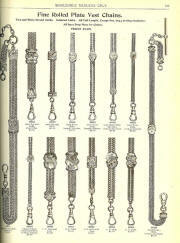 FINE rolled plate vest watch chains. 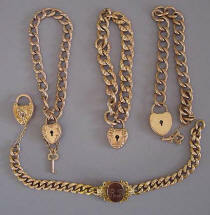 VEST silk fob watch chains. GENUINE onyx pins and ear drops. 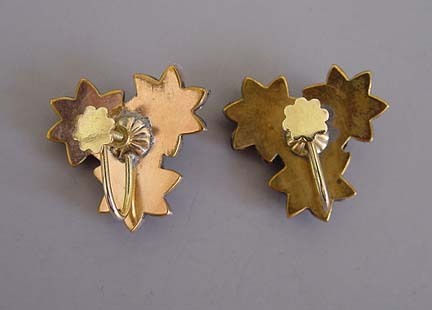 SOLID gold, sterling silver and rolled plate hat pins. 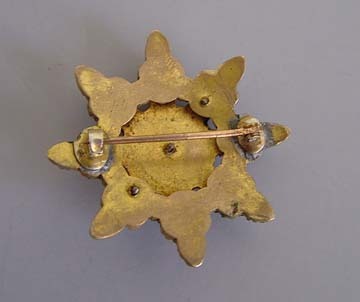 FINE gold filled rolled plate brooch pins. 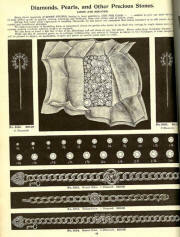 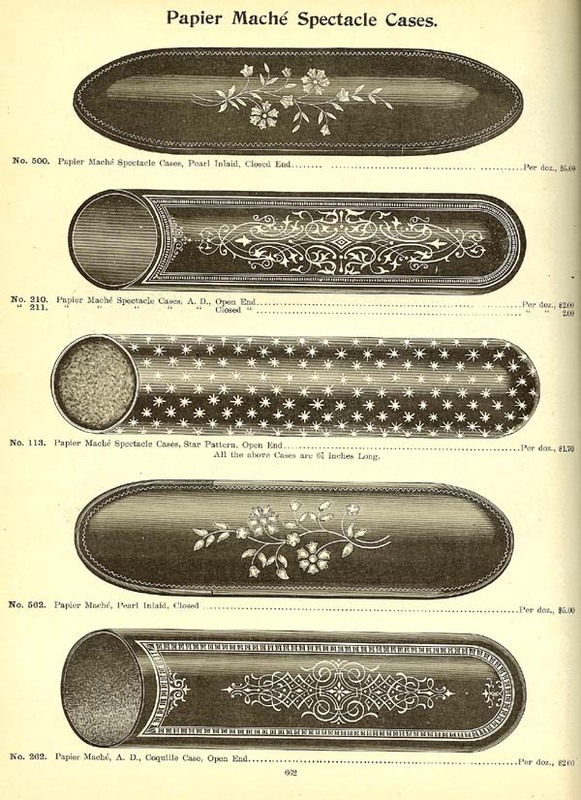 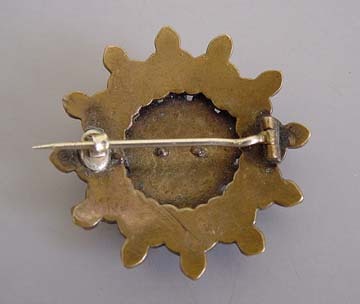 ROLLED plate brooch and lace pins. 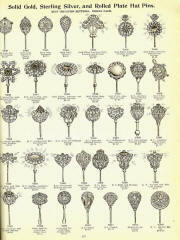 FINE solid gold brooch pins. 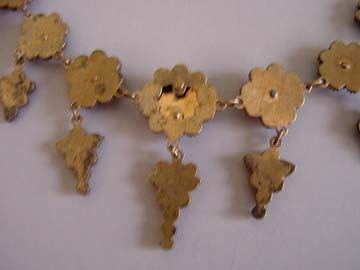 FINE gold front brooch and lace pins. 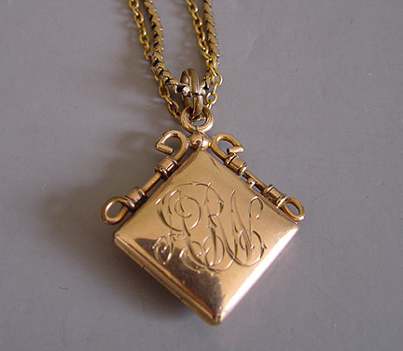 FINE solid gold lockets... we can furnish any initials. 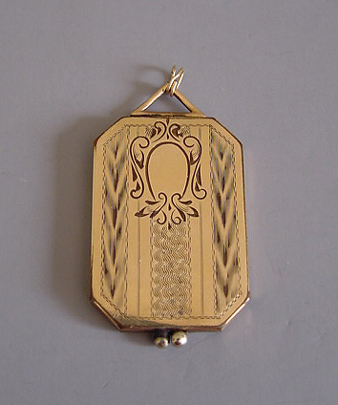 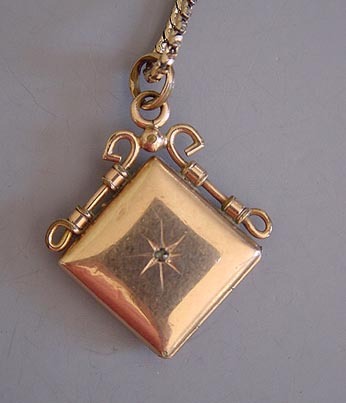 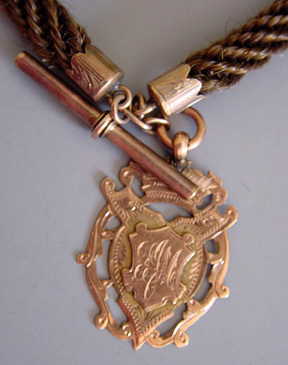 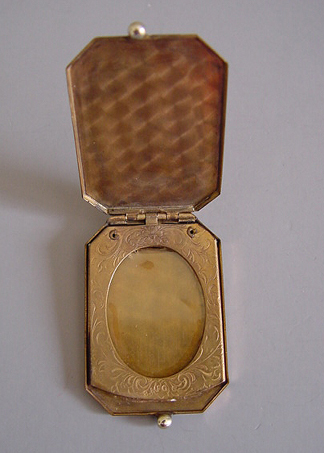 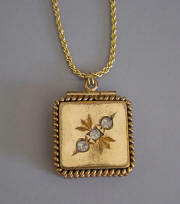 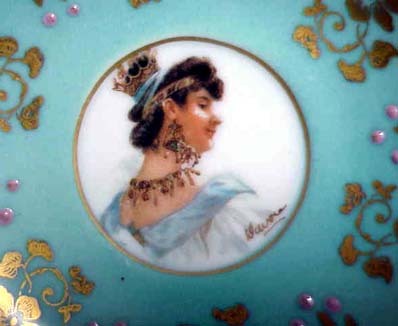 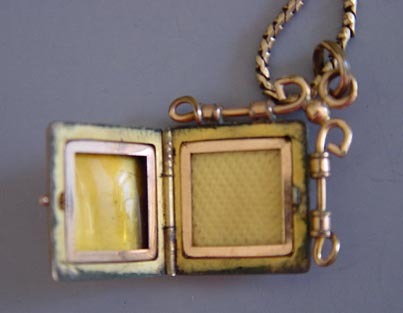 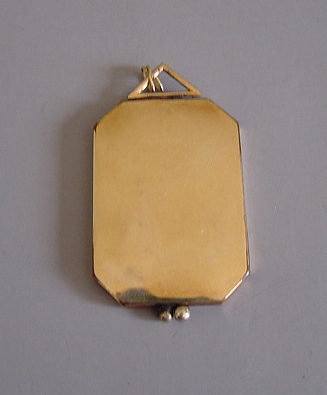 GOLD TONE square fob locket with rhinestone engraved "ARN", circa 1900. 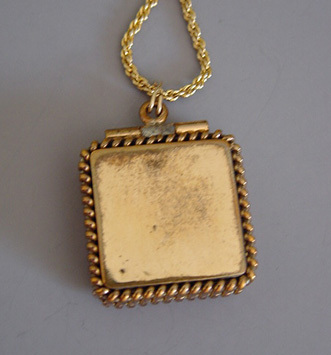 View View #Y22832 SOLID gold slide lockets. 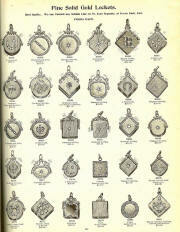 FINE solid gold charms. 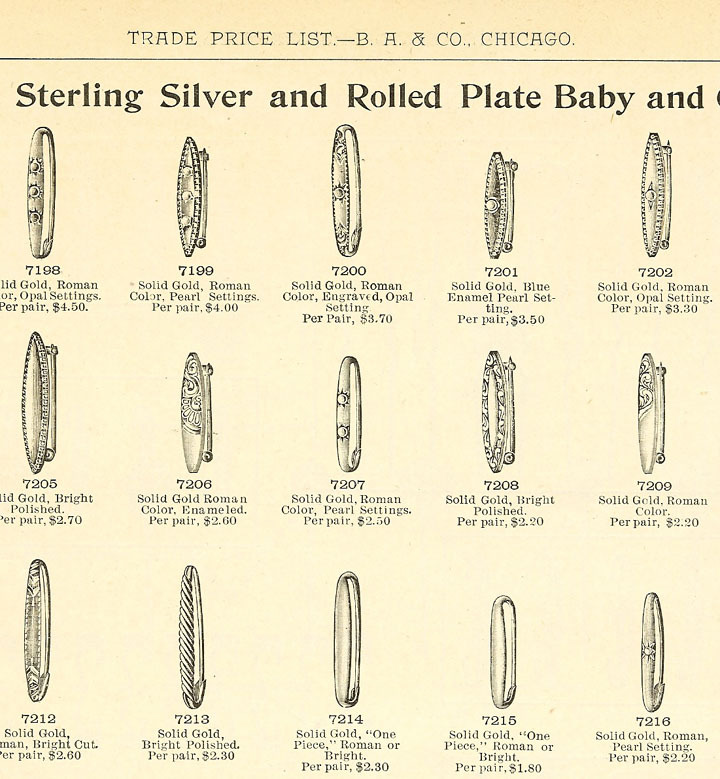 ROLLED plate charms. 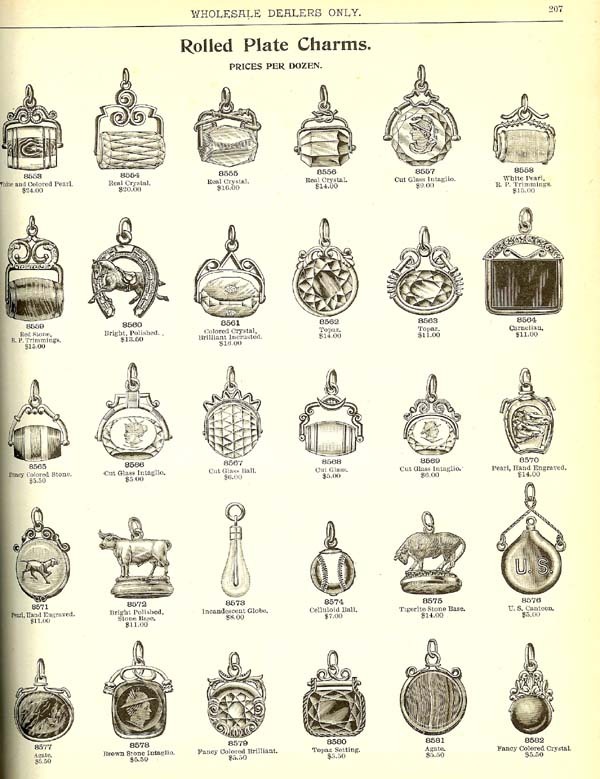 FINE solid gold charms. STERLING silver manicure sets with cases. 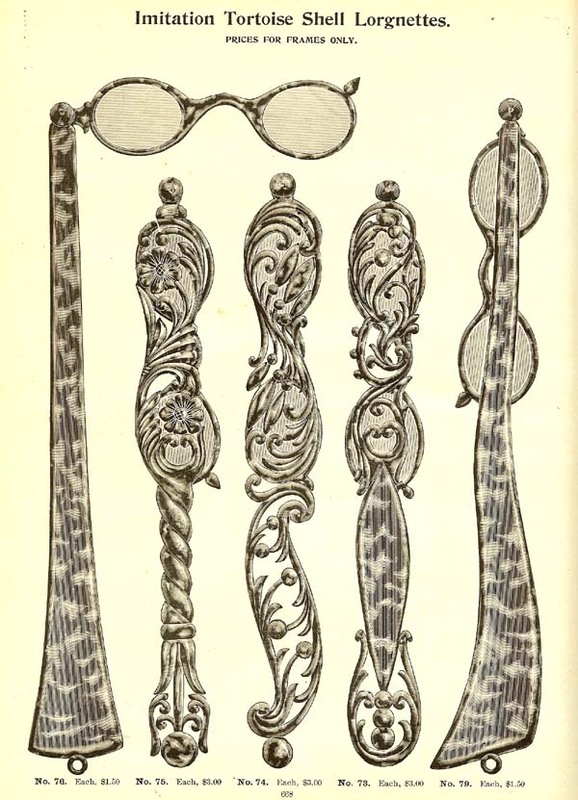 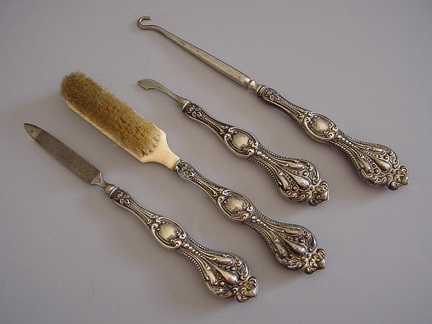 STERLING Victorian toiletries set of 4 pieces in an ornate scroll and dot design: a nail file, 6-1/2", button hook 7-1/4", brush 7", cuticle pusher 5". 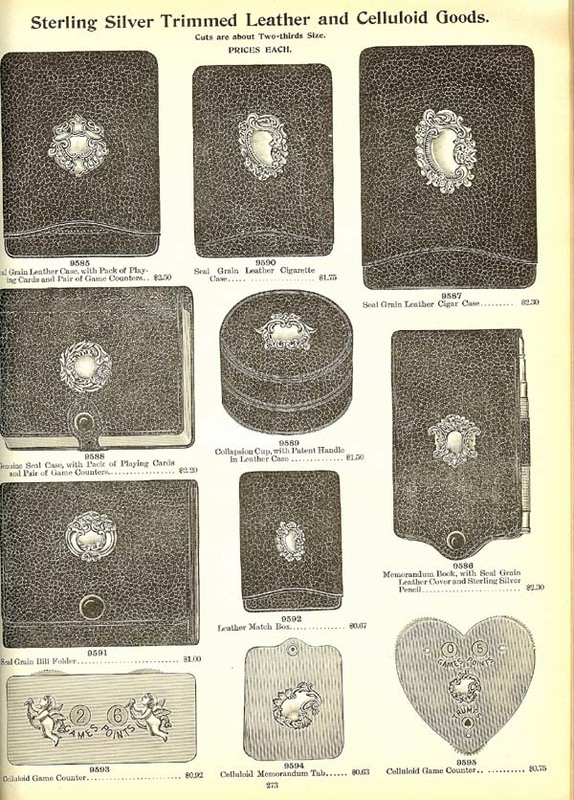 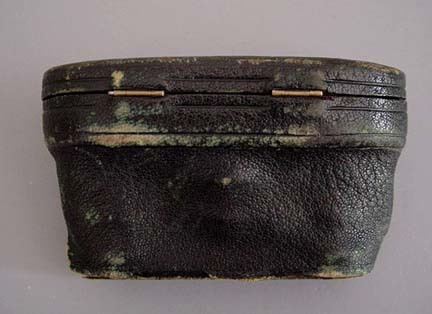 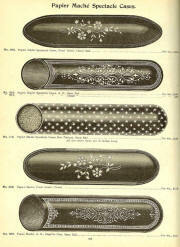 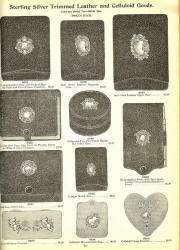 View #a17411 LADIES' garters. 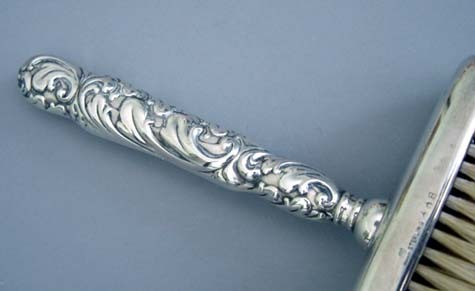 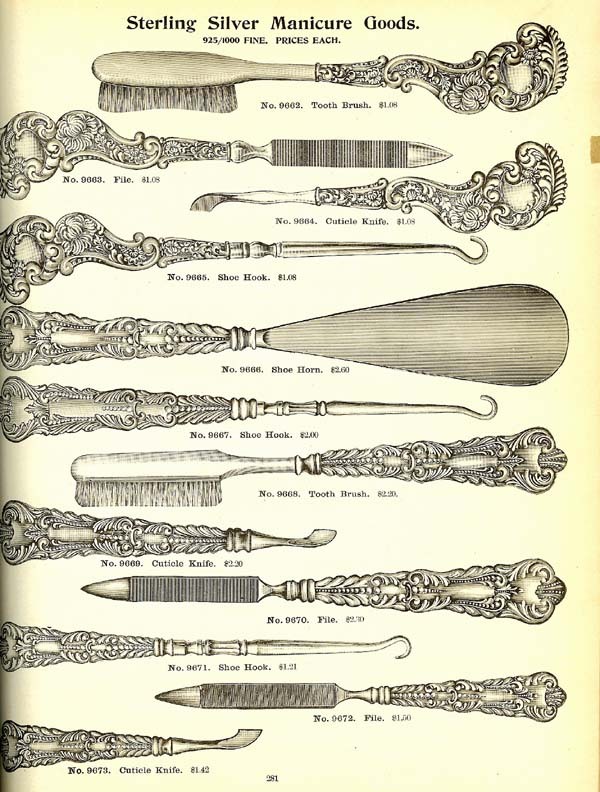 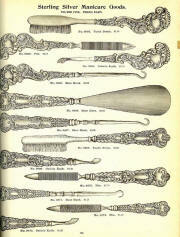 STERLING silver manicure goods. 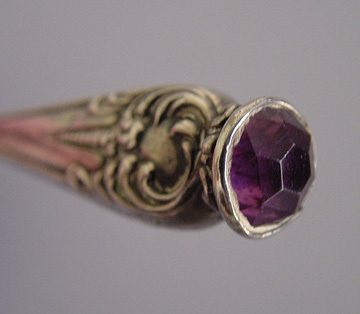 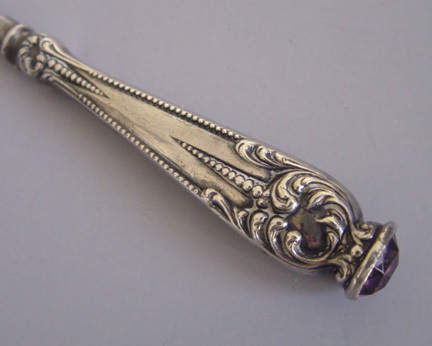 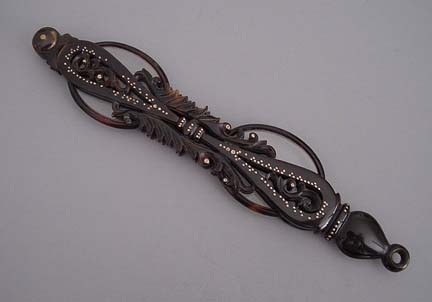 STERLING handled button hook with purple rhinestone tip, 6". View View #a51009 GOLD filled goods, pin tray, roller blotter, cigarette case, match box, bon bon box..
STERLING silver novelties. 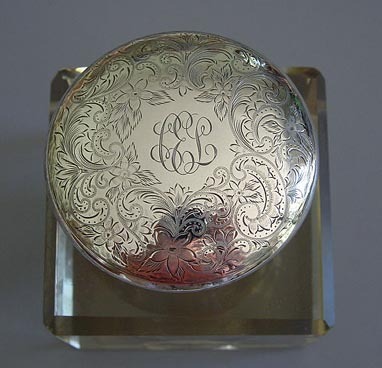 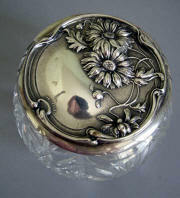 STERLING lidded cut glass dresser jar with repousse daisy motif, 3-5/8" by 3". 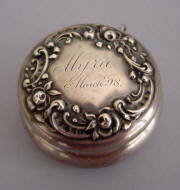 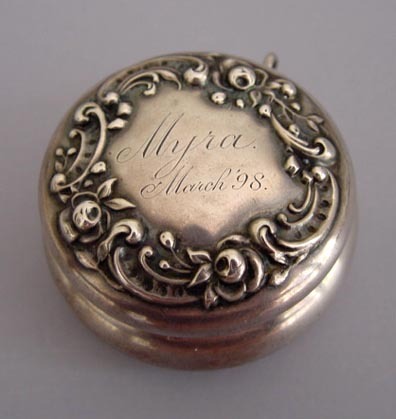 Marked "sterling" on lid, slight dings on side of lid. 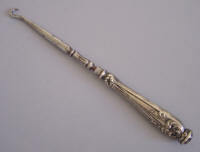 #a4429 STERLING silver goods, brushes, darner, bell. FINE quadruple silver plated ware, lunch caster, 4- and 5-bottle castors. 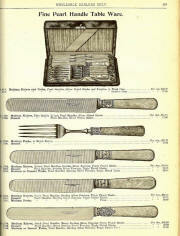 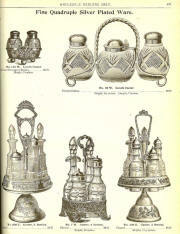 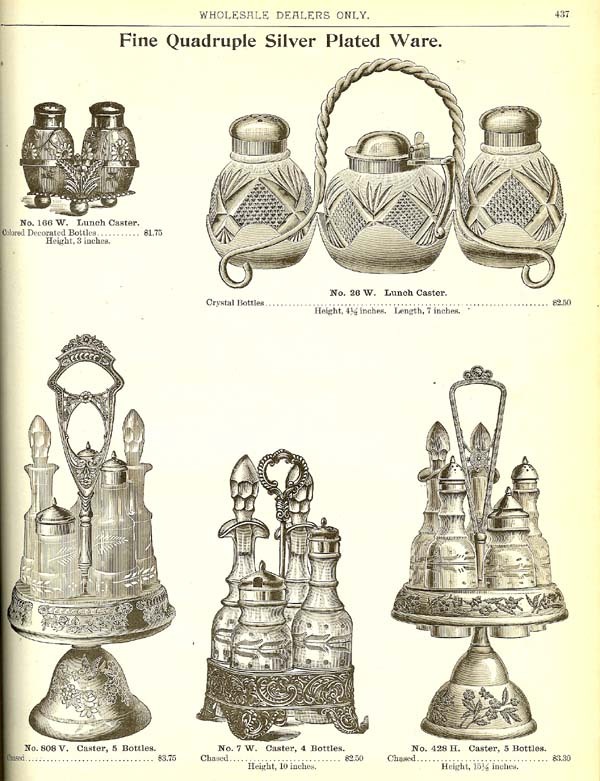 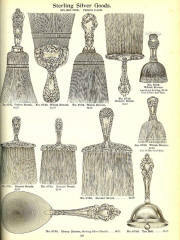 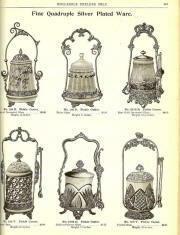 FINE quadruple silver plated ware, pickle castors. 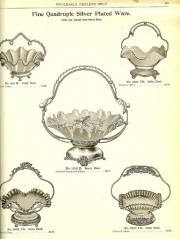 FINE pearl handle table ware. 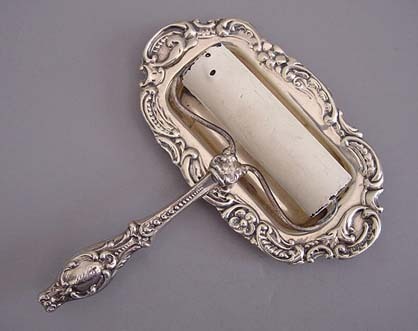 STERLING silver trimmed leather and celluloid goods. 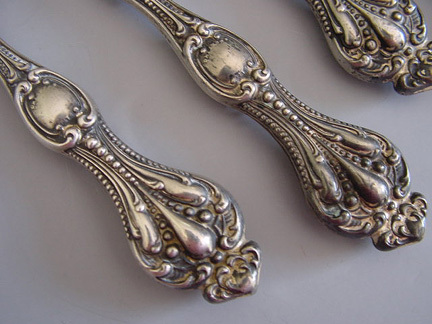 FINE quadruple silver plated ware, jelly dishes, berry dishes. 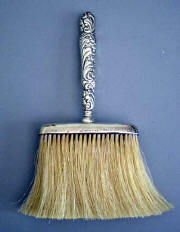 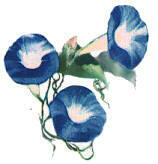 These are often referred to as bride's baskets today. 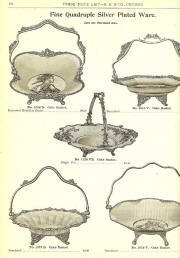 FINE quadruple silver plated ware, cake baskets. 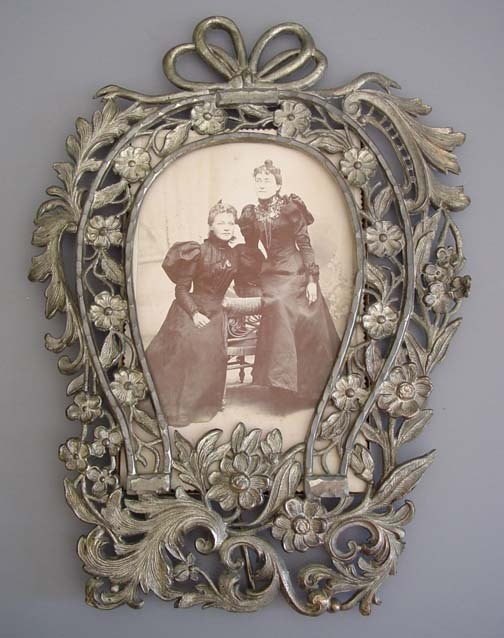 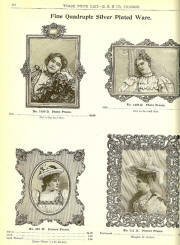 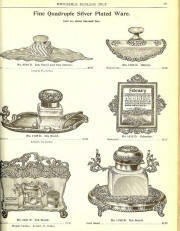 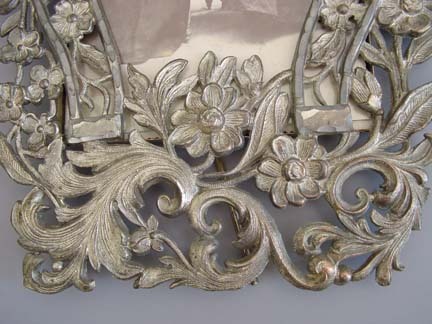 FINE quadruple silver plated ware, photo and picture frames. FINE quadruple silver plated ware, ink stand, calendar, pen holder, rocker blotter. 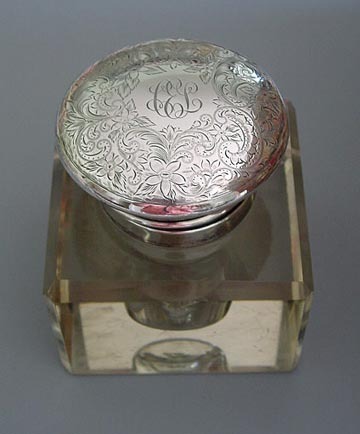 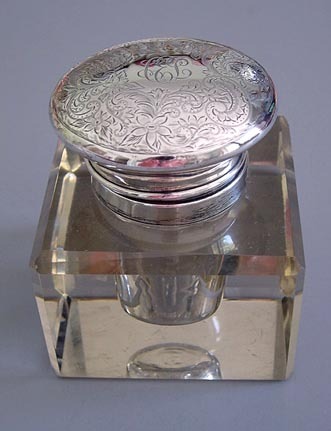 WSW sterling lidded heavy beveled crystal ink well, 3-1/2" wide by 3-3/4" tall. View View #a22728 FINE quadruple silver plated ware, atomizers. 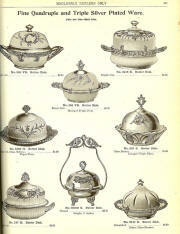 FINE quadruple silver plated ware, butter dishes. 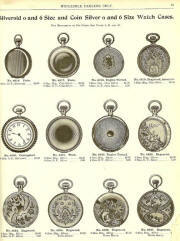 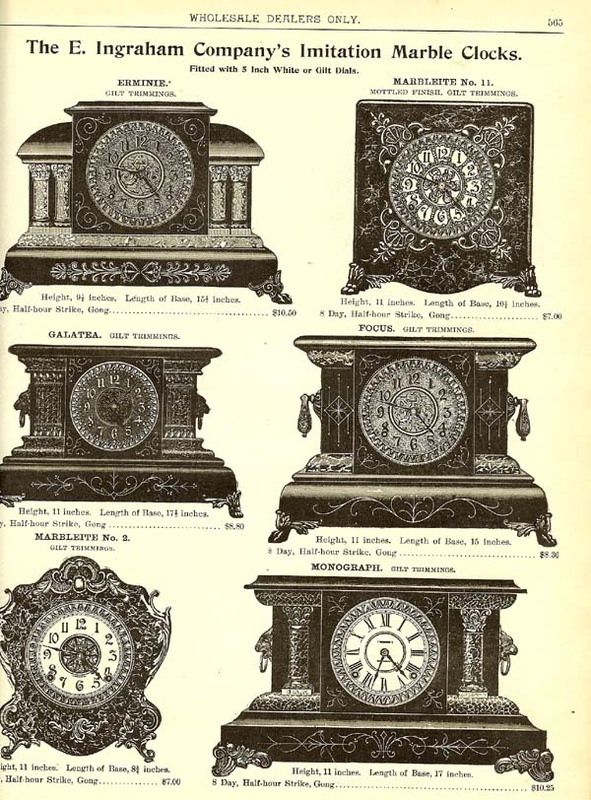 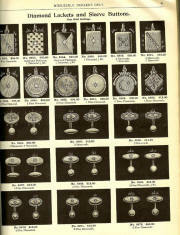 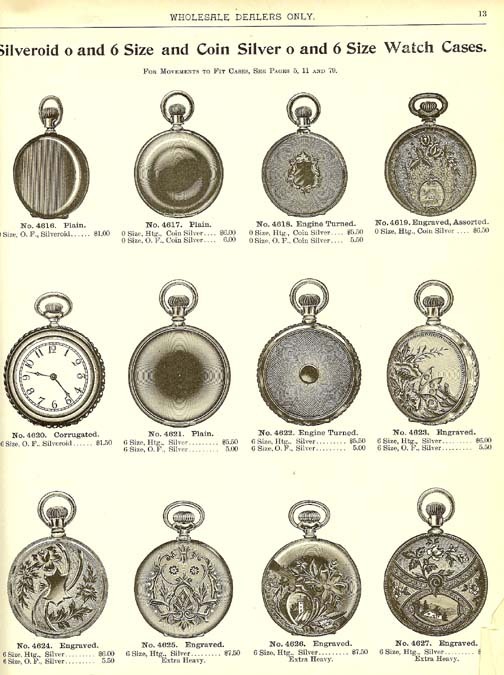 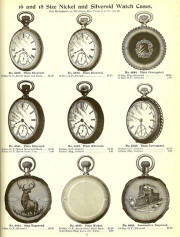 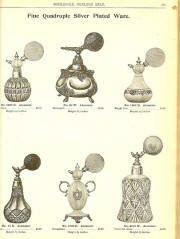 E. INGRAHAM Company's imitation marble clocks.